Summary: There's no other laptop with the size, looks and features of the VivoBook S15 S510 available for the same kind of money right now. 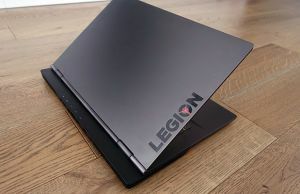 This is a full-size notebook with a 15-inch screen and yet a compact footprint and weight of around 3.6 lbs, a notebook that offers a backlit keyboard, matte IPS screen, good IO, fast wireless and modern hardware for around $700-$800 for the best buy configurations. 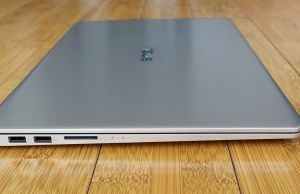 The downsides are the somewhat flimsy plastic main-chassis, the rather small 43 Wh battery and the mediocre webcam, but I reckon many will be able to look past these in the grand scheme of what this VivoBook is, that's why it gets a solid rating in this review and our recommendation. Read on for the whole story. 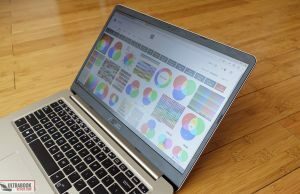 We’re having a look at a new mid-range series of laptops in this article, scheduled for release in the second part of 2017, the Asus Vivobook Slim. This is not your average notebook line though, as it’s one of these new iterations of thin-and-light computers that put a big screen with tiny bezels inside a compact and light body. 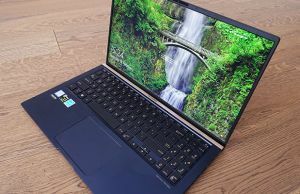 We got to spend time with probably the most interesting member of the line, the Vivobook S15 S510UQ, a 15-inch laptop that weighs just 3.6 lbs and offers modern Intel Core U hardware, dedicated Nvidia Graphics, dual-storage, a backlit keyboard and for most configurations, an IPS FHD screen. The Vivobook S510 series is however available in a bunch of different options, with dedicated graphics (S510UN – MX150, S510UQ – 940MX, S510UR – 930MX) or without (S510UA), as well as various Intel Core U processors, screen options and amounts of memory and storage. 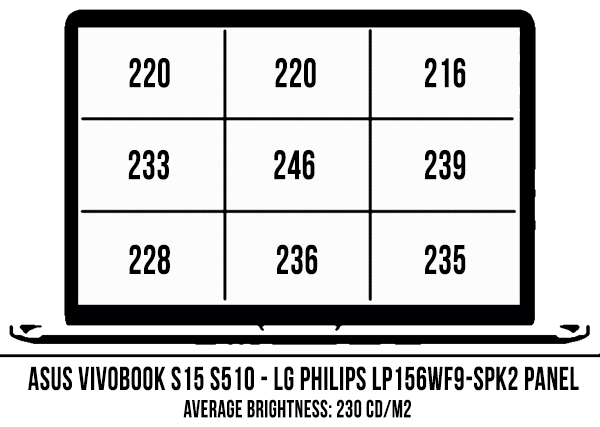 At the same time the same series is sold as VivoBook F510 in the US. 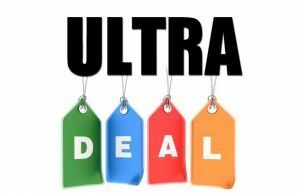 Prices start at around $500 for the base Vivobook S15 S510UA model with a Core i3 CPU and a TN HD display, and go up to about $$900 – $1000 for the higher end S15 S510UN models with Nvidia MX150 graphics, the IPS FHD screen and dual-storage, which is similar to the version we’re talking about in this article. On top of these variants, Asus also plans to offer 14 and 17-inch Vivobook Slims, but more about those in later posts. For now we’ll focus entirely on the S15 S510 series, with all its goods and quirks. And while our test unit is the S510UQ model with Nvidia 940MX graphics, our findings also cover the S510UA, which are identical and just lack the Nvidia chip on the motherboard, or the S510UN models, an updated version with an 8th gen Core i7-8550U processor (more about this line of 8th gen Intel processors here) and Nvidia MX150 graphics (more about this chip here). I have to get this out from the beginning, this Vivobook S510 is one of the nicest 15-inch laptops I’ve ever got my hands on, and it’s merely the mid option in Asus’s new line. 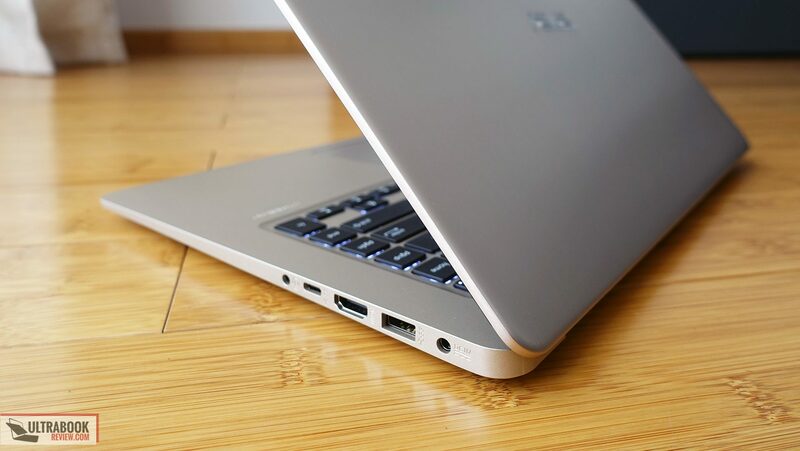 Of course, there are quite a few devices with more premium builds and finishes out there, like the Zenbook UX530, LG Gram 15, Samsung Notebook 9 or Dell XPS 15, but for something that sells for a lot less this Vivobook is surprisingly small, light and appealing. It weighs about 3.6 lbs in the configuration we got for this test, and it’s slim and petite for a 15-inch laptop. You’ll understand why when you’ll open it up and see those narrow bezels around the screen. But before we get to that, let’s turn our attention on the outer case. 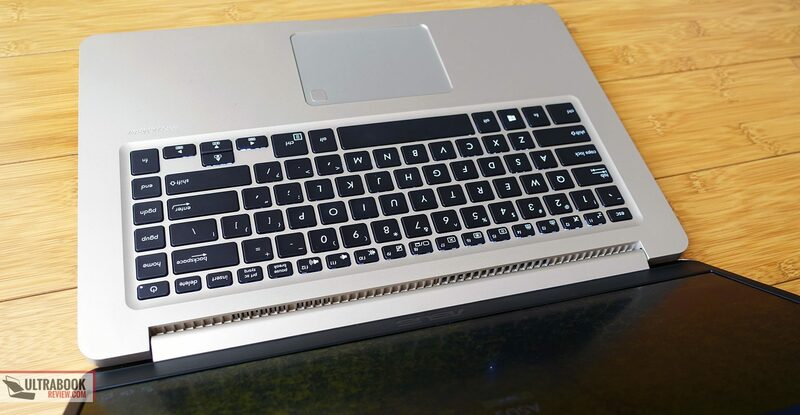 This notebook is made from a mix of silver aluminum (Asus actually calls in Gold-Metal, but it looks more like silver to my eyes) on the hood and smooth plastic on the underbelly and interior. The light color choice is ideal, as it hides smudges and potential scratches, and the build quality is pretty good too, none of the materials feeling cheap by any means. The lid is pretty strong, despite its thinness. It’s made from a thicker piece of metal so I feel it matches the build quality of the higher end Vivobook Pro and Zenbook series. 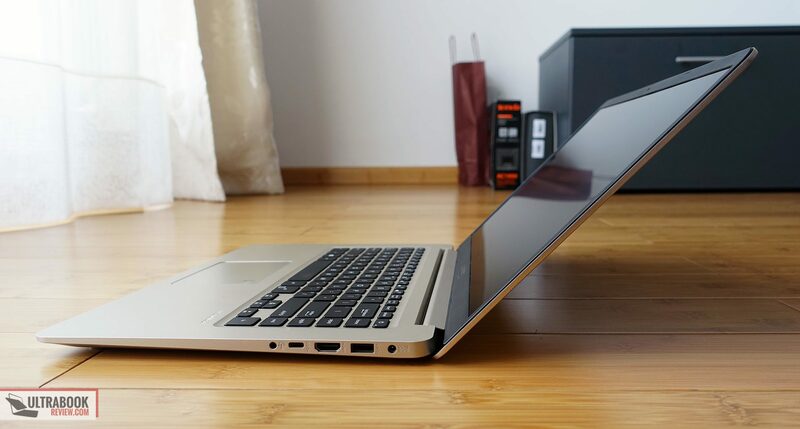 It doesn’t give much when pressed, so there’s no need to worry about any impact on the screen beneath when having the laptop in your backpack. The main-frame on the other hand is entirely plastic and not as solid, which means you’ll notice a fair amount of wobbling and warping when typing, especially towards the top side of the keyboard. There’s still a metallic plate on the inside, beneath the keyboard, but the plastic shell is fairly thin and hence the flex. It’s quite obvious in actual use for someone like me who’s accustomed to sturdier chassis, but it didn’t actually bother me that much and is the only corner Asus cut on this product’s build and design. In fact, this laptop is very comfortable in use. It gets a matte screen with a tiny black bezel, a spacious enough palm-rest and space for a proper keyboard and a big trackpad. The speakers are placed on the bottom, towards the front, and can be covered fairly easily when using the computer on the lap, but that aside, there’s nothing I can nitpick on. 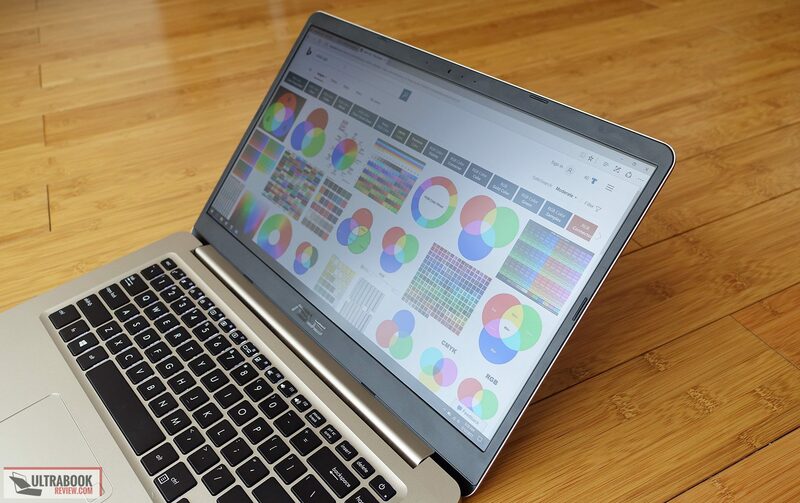 Build and looks aside, this Vivobook S510 is also practical. It’s easy to lug around thanks to its reduced weight and size, it sits nicely on a desk thanks to the four rubber feet on the belly and it fits on the lap, again due to its compact format. The screen can be picked up with a single hand and the hinge does a nice job at keeping it in place. It also allows it to tilt back to about 150 degrees, which is not ideal for an ultraportable, but will suffice for desk and most lap use cases. 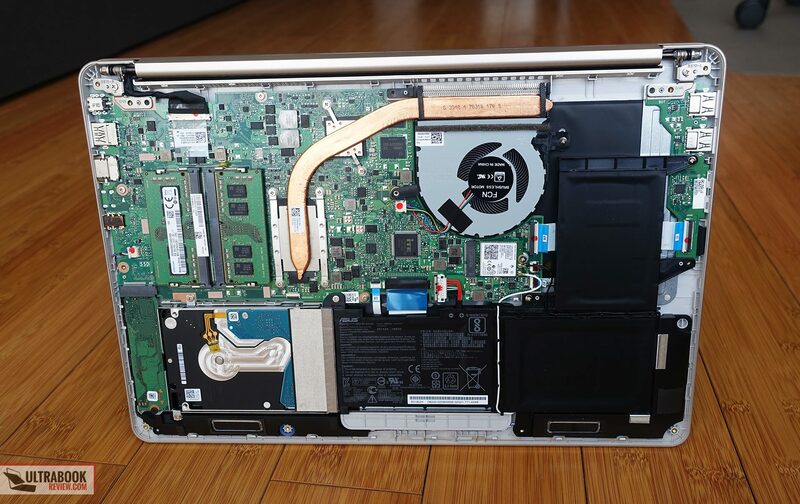 I also appreciated that there aren’t any sharp bits or misaligned parts around the body, which tends to happen with some lower-end laptops. 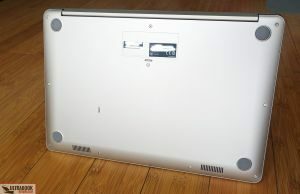 The edges are a bit sharp, but this laptop has a very low profile and the main-case is made out of plastic, so they are not as sharp as on other devices with metallic builds. As a result, my wrists didn’t have anything to complain about them. Asus put proper IO on this laptop, despite shrinking it down. You’ll find three full-size USB slots, an USB Type C gen 1 (without Thunderbolt 3), a card-reader, and audio-jack and a full-size HDMI port for video output. Most of these are placed on the right edge, where you’ll also find the PSU. All in all, I have to say I’m surprised by how nice a mid-level laptop like this Vivobook S510 can be. 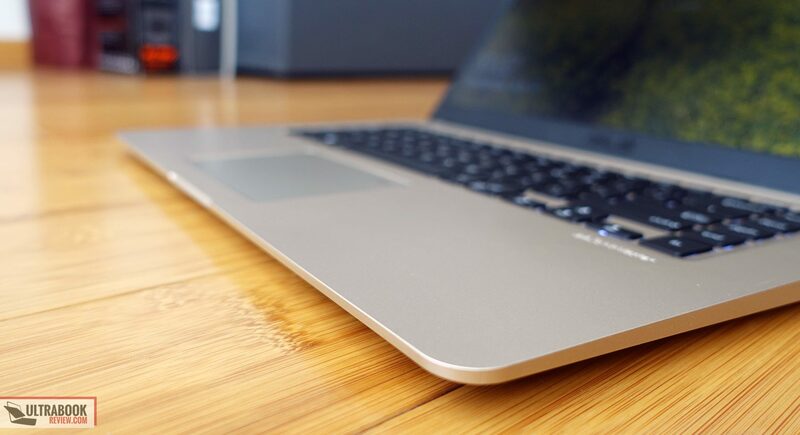 It’s fairly well made, slim, comfortable to use and practical, with the only lacking aspect being the overall sturdiness of the main body, but even so there aren’t many laptops with similar traits in this segment. I expect that to change in the months to come, till then though, this Vivobook is a laptop like very few others. Asus went with a 15.6-inch screen on the VivoBook S510, with a completely matte finishing and tiny black bezels around it. They’re not as small as on the XPS 15, but they’re damn close and actually allow for the webcam and mics to be placed on the top, like they should be. 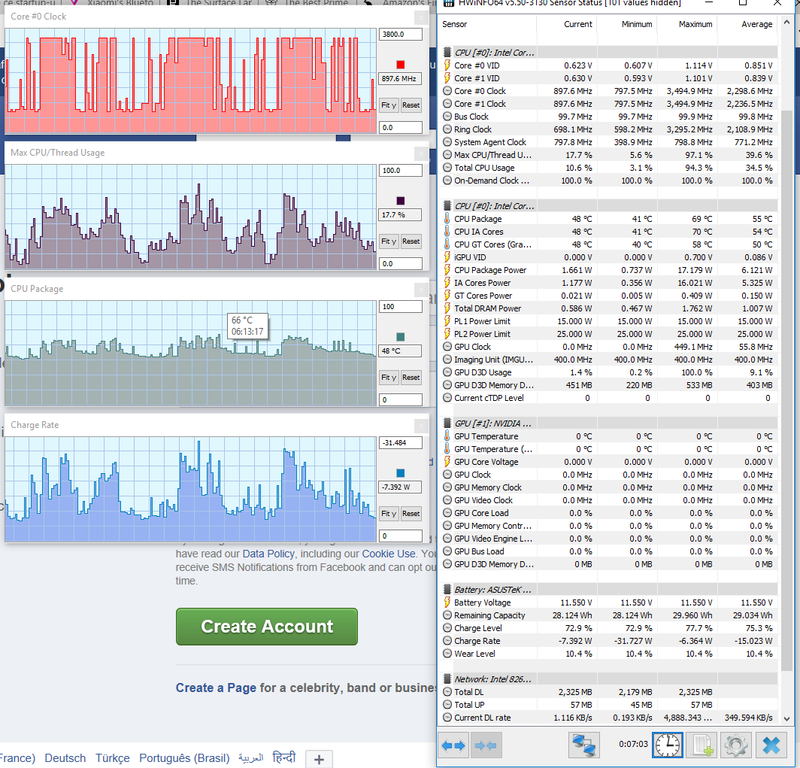 There are two screens to choose from, a TN 1366 x 768 px panel and an IPS 1920 x 1080 px option. We haven’t seen the former in action, but I would definitely advise picking the IPS version instead, it’s ages apart in terms of overall quality and not that much more expensive either. The IPS option is an LG Philips panel with average traits, but again, much better than the TN alternative: max brightness of around 250 nits, which will suffice for indoor use but not that much for outdoors and bright environments, good contrast, decent viewing angles and somewhat washed out colors and limited gamut coverage at 51% AdobeRGB. 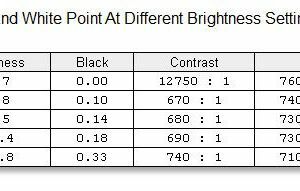 You can however improve on the gray levels and colors to some extent by using our calibrated screen profile available over here. This panel is in fact pretty similar to what most other OEMs put on laptops in the $600 to $1000 price range these days and all-in-all I believe most users should find it good enough for daily use, multimedia content and some games. It’s definitely not something professionals would use in their work though, as you can tell from the details below. Average DeltaE: 2.33 uncalibrated, 0.97 calibrated. I’ll also add that this screen is well built and our sample didn’t suffer from any noticeable light bleeding around the edges, but that’s not a guarantee yours won’t though. The display is also easy to operate with a single hand and leans back to about 150 degrees, which is fine for most daily use scenarios, although ideally it would be capable of going back flat to 180 degrees. I’ve read some opinions online claiming this keyboard feels shallow and the flexible main-body takes a major toll on the typing experience. I agree with the latter aspect, yes, the constant warping of the plastic chassis is noticeable and somewhat annoying, but even so I actually found my time with this keyboard a pleasant experience. With several thousands words in the bag, I can say this types accurately and the keys have a nice, springy feedback. 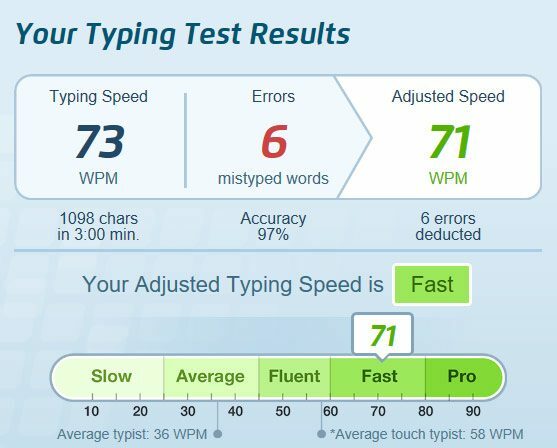 They definitely don’t feel shallow, in fact I’d say they’re actually firm and need a heavier push to register, which somewhat lowered my overall typing speed, as you can see below. 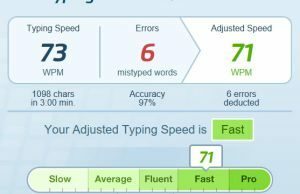 It’s not the best option for someone who types for a living, but it will do alright for the average consumer. 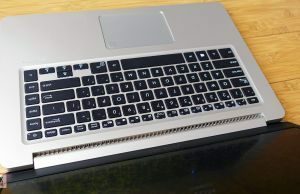 This keyboard is also fairly quiet and backlit, white white LEDs and two brightness levels to choose from. As far as the layout goes, it’s pretty good, with proper sized and spaced 15 x 15 mm keys and an extra column of dedicated function keys on the right side that you’ll need some time to get used to. The arrows are short, but at least they’re nicely spaced from the rest of the keyboard, and there’s no NumPad section which some of you might miss, but I for one did not. For mouse Asus went with a plastic made Elan clickpad with Microsoft Precision drivers. 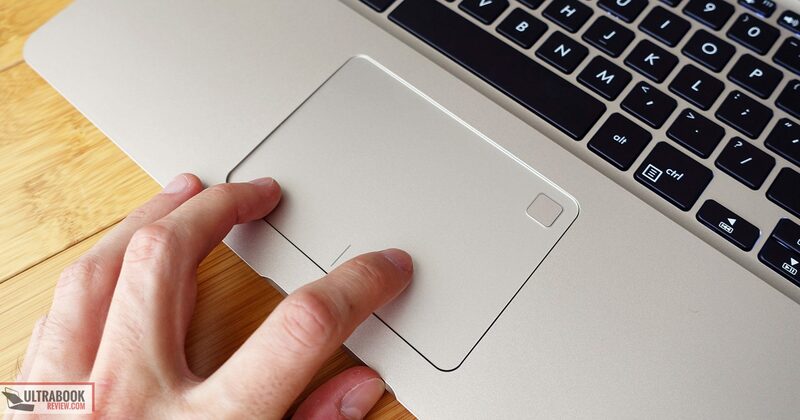 The plastic surface is somewhat rubbery and prevents fingers from gliding as smoothly as on other clickpads, especially the glass ones. As a result very precise swipes are a little difficult to perform, as the surface would sometimes catch to my finger and not allow to move the cursor smoothly those last few mms that I would need. I also found it rather slow out of the box, but that can be tweaked from the settings. Overall though, this clickpad works pretty well. I had no issues with gestures and found the click buttons pretty good too, with a nice click and sound. It’s also worth adding that the surface did not rattle with daily taps, as most other plastic clickpads do. 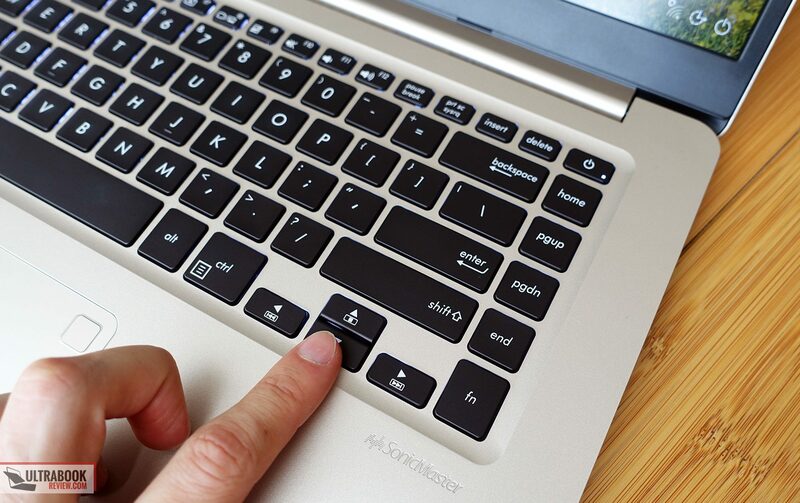 As a side note, Asus integrates a finger sensor within the top-right corner of the clickpad, very useful for quickly logging into Windows with Hello and a feature I now consider a must have on my next laptop. 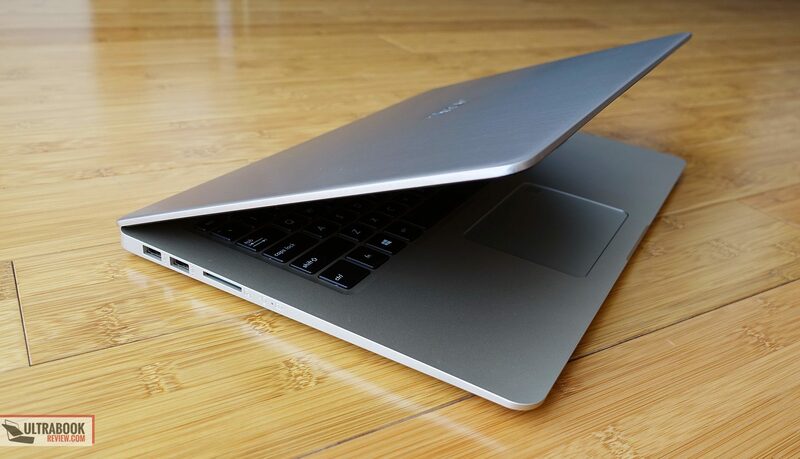 As I mentioned in the beginning you’ll find the Vivobook S15 S510 in a multitude of configurations, and our review option is the highest tier configuration with a Core i7-7500U processor, Nvidia GTX 940MX 2 GB DDR5 memory, 16 GB of DDR4 RAM, a 512 GB M.2 SSD and a 2.5″ 2TB spinning HDD. Aside for the CPU and GPU, all the components are accessible and upgradeable by removing the back panel, which is hold in place by a handful of Philips screws. Careful they’re not all the same size, so make sure you note where each comes from. There are also two screws behind the rear rubber feet, so make sure you get to those as well. 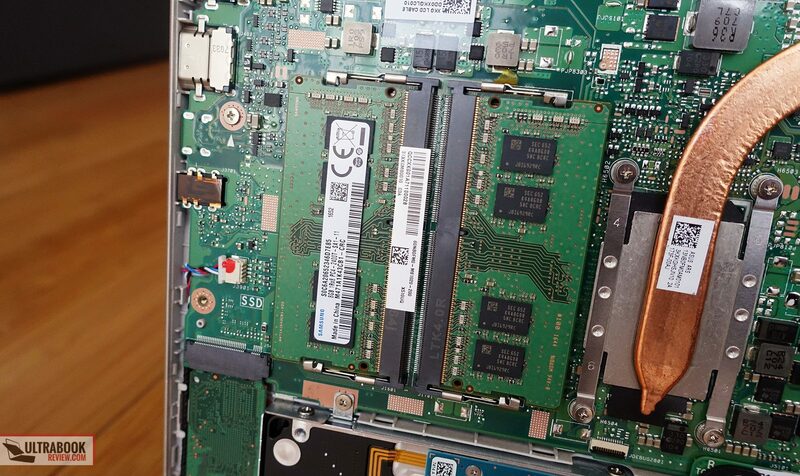 Inside you’ll notice the two memory slots, for a total of up to 32 GB of RAM, a M.2 80 mm SSD slot and a 2.5″ 7 mm bay. 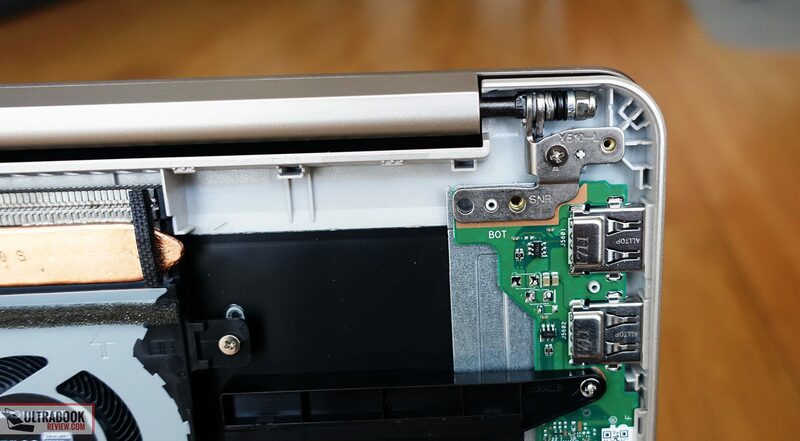 The M.2 slot uses a B-key connector, so only B&M key SATA SSDs are compatible. The wireless chip and battery are also within reach in case you would ever have to replace them. With that out of the way, let’s take a few minutes to talk about the hardware inside. First of all, unless you plan to put this laptop to some serious work you’re not going to need the i7, the Core i5-7200U option will do just fine and help save around $100. 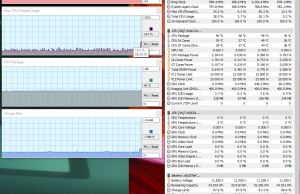 It will also run a little cooler, which actually matters on a laptop as thing as this one. 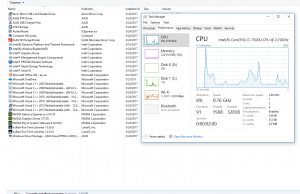 Just make sure you get rid of the bloatware that comes preinstalled on this laptop, it takes a toll on performance. 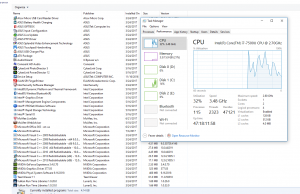 For RAM, you’d need at least 8 GB for daily use and you can add more if needed. 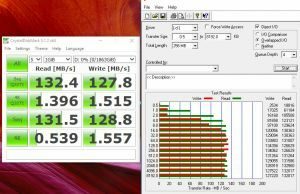 For storage you should absolutely get an SSD, it’s night and day in terms of performance from having just a regular HDD. The HDD will do fine for mass storage, but it’s also a noise source, so if the budget allows you can replace it with a 2.5″ SSD as well. As for the GPU, you can get the laptop as of right now with either a GTX 940MX dedicated chip or without dedicated graphics, in the S510UA versions. If you won’t plan to run any games on your computer, get the UAs, they’re cheaper, quieter and cooler under load. If you do plan to run games than the 940MX is a decent pick, especially since it’s not an expensive upgrade (about $75 on top of an UA configuration). It’s important to know that Asus puts the updated version of the 940MX chip in this notebook, with GDDR5 memory and increased performance, it’s not the old GDDR3 model from 2015 and 2016 laptops. You’ll see how the two compare in games below, where we’ve also added what to expect from the Intel HD 620 chip that you’ll rely on the UA models, for comparison. Albeit still an entry level dedicated chip, the 940MX on this laptop can run smoothly most titles released in the last few years at FHD resolution and low details, and it’s about twice as capable as the integrated Intel HD 620 chip. 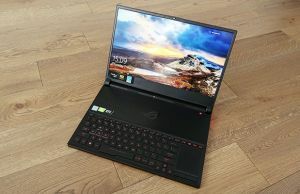 I’d expect future versions of this laptop to get the newer Nvidia MX150 graphics at some point, which is an even faster solution, as you can see in this article. We also ran a few be benchmarks on our sample, and here’s what we got. 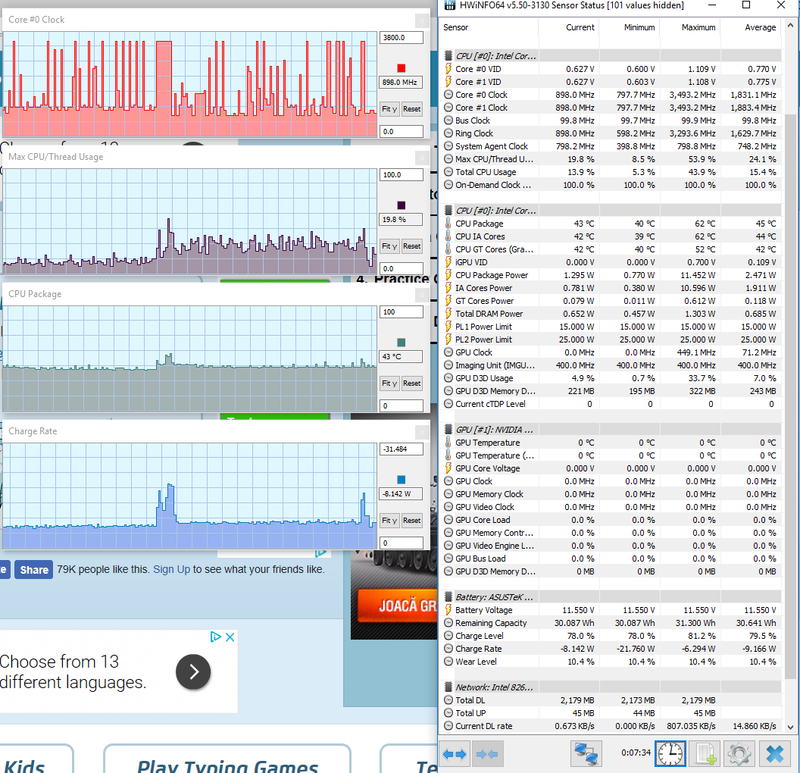 These results are pretty solid, except for some of the CPU related scores. 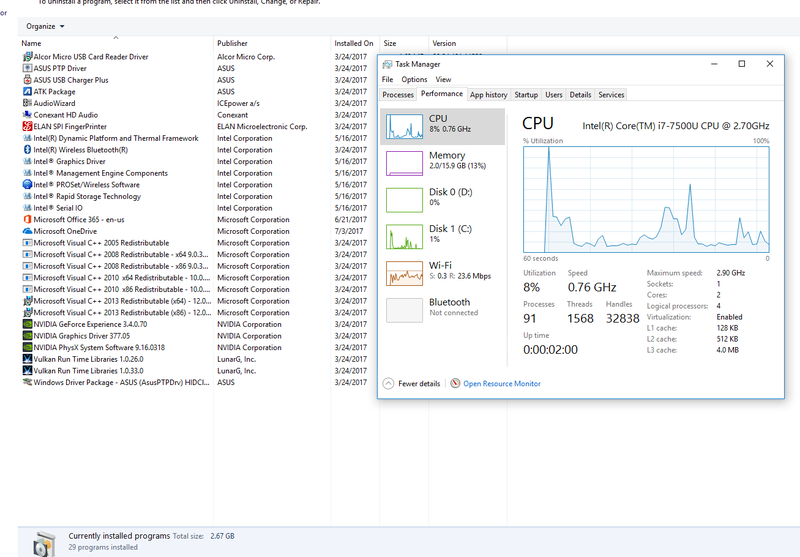 The i7 processor heats up and drops to about 3.2-3.3 GHz in some benchmarks, a little bit under the maximum TurboBoost speeds of the i7-7500U (of 3.4 GHz). That’s not going to be any issue in games, but has a slight impact in some synthetic tests. However, you should keep in mind we’re testing a pre-release version of this Vivobook S15, so performance will improve on the final retail versions. In fact, from what I can tell right now, I’m confident this laptop will be able to squeeze the most out of the i7 + GT 940MX configuration, even if the CPU and GPU are going to run at mid 80s in continuous loads. 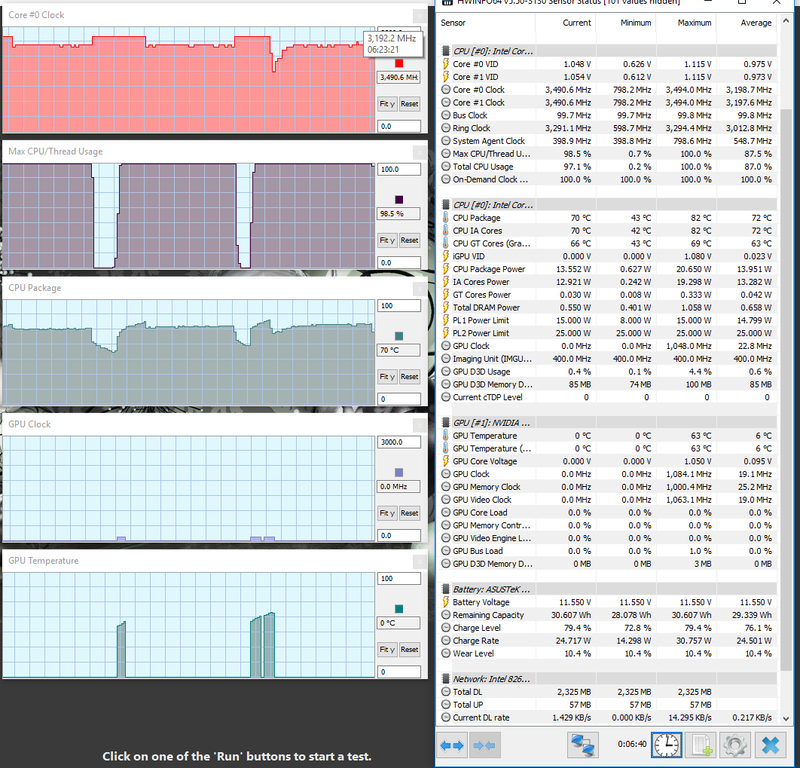 You’ll find more about CPU/GPU speeds and temperatures in several scenarios in the pictures below. The cooling is illustrated in the picture below, a basic build with a single fan and one heatpipe that spreads over both the CPU and the GPU. This is what Asus uses to cool all their laptops with similar hardware configurations, yet perhaps they could have went with something a little more elaborated here, as this updated GT 940MX chip runs hotter than the DDR3 version we’ve last tested on the Zenbook UX410UQ for instance, a laptop with very similar dimensions. With long gaming sessions the CPU and GPU averaged temperatures in the mid 80s on the Vivobook S510UQ (pic in previous section) and only mid 70s in the Zenbook UX410 (source). 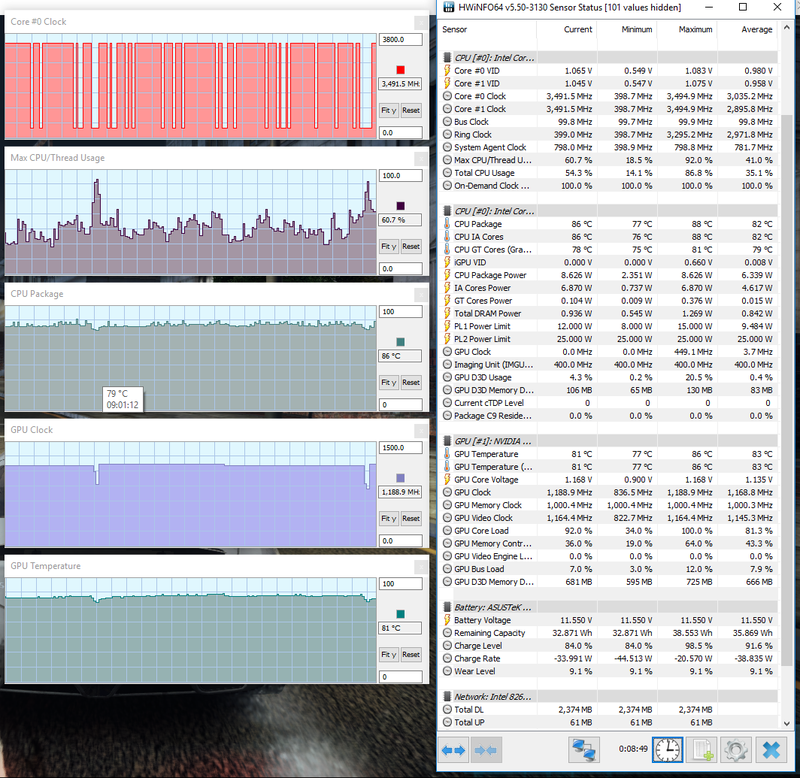 This can be explained by the different GPU and by the fact that our Vivobook was a pre-release sample, but we can generally conclude this configuration is going to run fairly hot. For the average user, this translates is noise and fairly high outer case temperatures. The fan inside spins fast under load, but it’s not noisier than on most other laptops, averaging about 45 dB at head level. 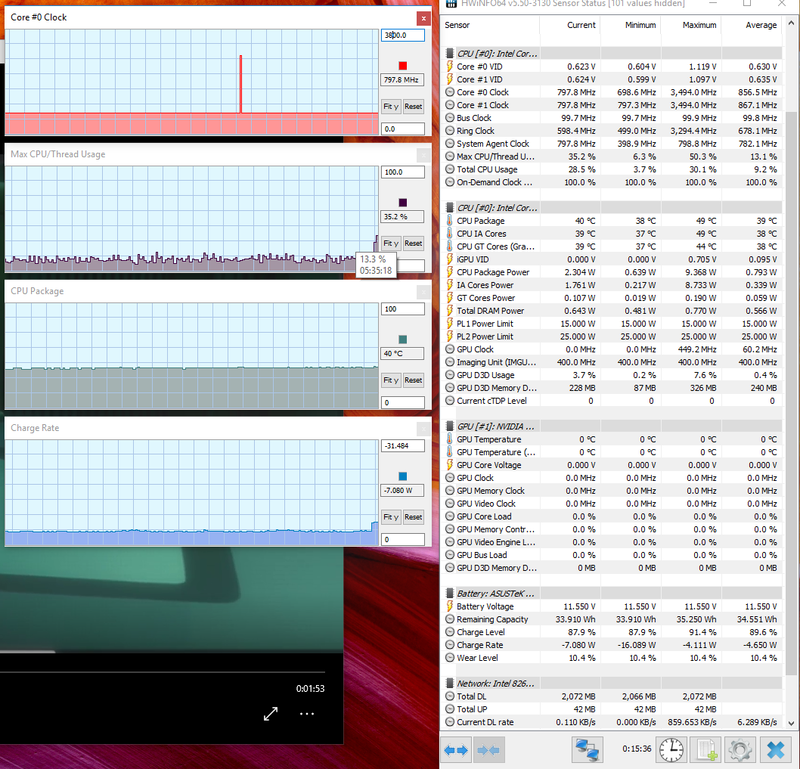 The Zenbook UX410UQ was quieter though, at about 43 dB. It also ran cooler, as this Vivobook S510UQ reaches mid 40 temperatures in certain spots on the back, as you can see below, so gaming on the lap is not really a possibility. The interior and especially the keyboard area stay within comfortable margins though. With daily use this notebook runs cool, but the fan is active all the time, even when there would be no need for it to spin. It’s also a bit noisy, averaging around 40 dB at head level with occasional spikes to 42 dB when multitasking, so you’ll definitely hear it in a quiet room. 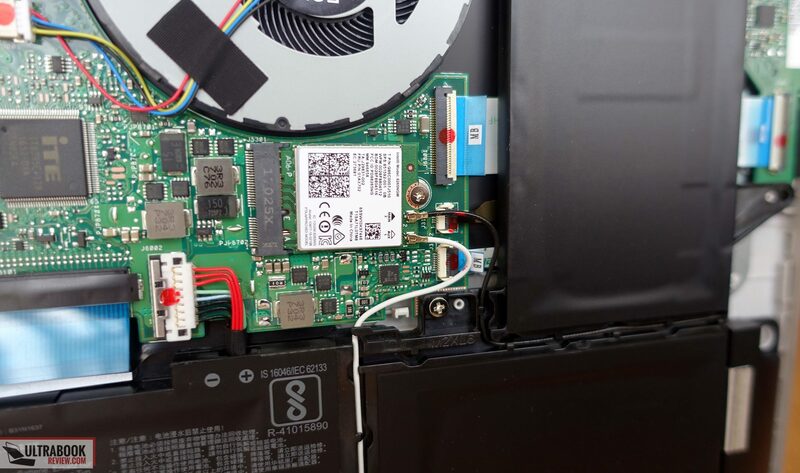 Aggressive fan behavior is standard for Asus laptops, so no surprise here. The HDD is also a noise source when in use and I also noticed a fair amount of electrical noise on our sample, which hopefully won’t plague the final retail models, but it’s something to check for once you get your units. 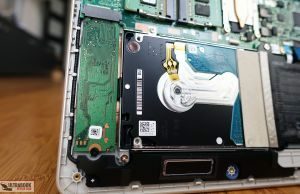 Before we jump to the next part of this article we have to add that Core i5 versions of this laptop will run a little cooler with marginal losses in games, and the S510UA models without dedicated graphics will run significantly cooler and quieter, which is one more reason not to get the UQs unless you plan to play games on your computer. Connectivity wise there’s Wireless AC and Bluetooth 4.1 in this laptop. Asus went for a good Intel 8265 wireless module on our sample and as a result we didn’t ran into any issues with the wireless performance and overall signal quality. 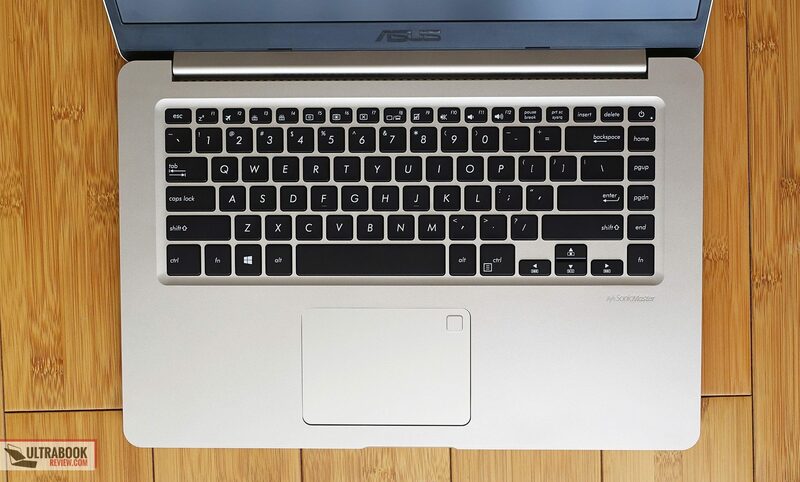 For audio the Vivobook S510 gets Asus’s SonicMaster entry level sound system, with two speakers placed on the underbelly. They’re fairly loud, peaking up at 80 dB at head-level, and they sound alright on the Music profile from the included Audio Wizard app. However, they do push vibrations into the main body at volumes above 50% and tend to distort at volumes above 80% when dealing with low-end sounds. So if you’re a bass-head, this laptop is clearly not for you, or you can always just turn to your pair of headphones. One final aspect to mention here is the webcam, placed on top of the screen and flanked by microphones. Unfortunately it’s merely a VGA camera, so the images and video coming out of it are mediocre to say the least. In order to save weight and costs Asus only put a 42 Wh battery inside this laptop, which is smaller than what the average laptop offers these days. Not a fan of skimming on battery size for any reason, but at least the IPS screen and the KabyLake hardware don’t require a lot of energy for basic activities and video playing. Still, you’ll only get about 3 hours of real life multitasking from this notebook in the reviewed configuration, which is poor for something that’s meant to be ultra-portable. More details below. 40 W (~1 h of use) – gaming on battery, High Performance Mode, screen at 50%, Wi-Fi ON. On the plus side Asus pairs this device with a very compact charger that’s able to quickly charge 60% of the battery’s capacity in about 50 minutes, but that’s little consolation for having a small battery and won’t help at all when on the go and not having a wall around anyway. I guess it’s better than nothing though. 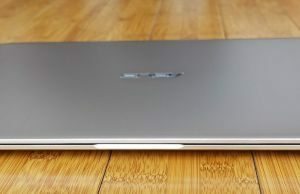 The Asus Vivobook S510 / F510 is listed a few stores around the world at the time of this article, and you can follow this link for updated configurations and prices in your region. From what we know so far we expect the very basic configurations to start at around $500 in the US and 550 EUR in Europe, for a Core i3-7100U processor, 4 GB of RAM, 1 TB HDD and a TN HD display. I would however recommend picking a configuration with the FHD IPS screen we had on our test model, which is a much, much better option. 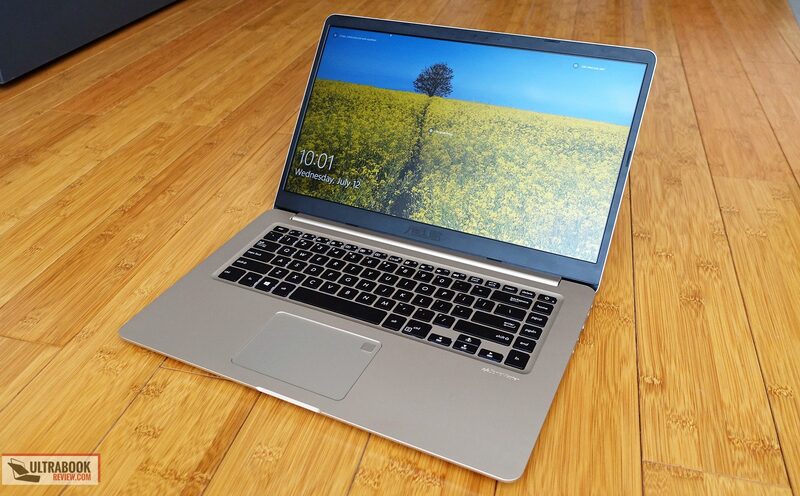 S15 S510UN / F510UA ~ 900 USD / 1000 EUR – Core i7-8550U, Nvidia MX150 graphics, 8 GB RAM, 256 GB SSD + 1 TB HDD, FHD IPS screen. Asus won’t offer all these options worldwide, but you can follow this link for updated configurations and prices in your region. 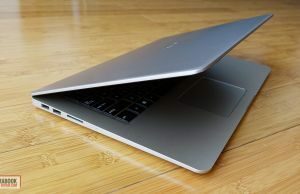 I took a while to look for laptops with similar features and size to this VivoBook S15 in the $700 – $800 segment, and there are very few options as of Mid July 2017, like the Dell Inspiron 7560, which is just as compact, gets the same hardware and battery size, but is heavier at 4.4 lbs. There’s also a 15-inch version of the Lenovo IdeaPad 320S scheduled for the next months, but can’t tell much about it at the time of this post. You can find laptops with similar configurations, like the Acer Aspire 5, Asus X556 or Lenovo IdeaPad 520, among others, but they’re not nearly as compact. And those that are similar or smaller in terms of size, like the Zenbook UX530, LG Gram 15, Samsung Notebook 9 or Dell XPS 15, sell for a few hundreds more. 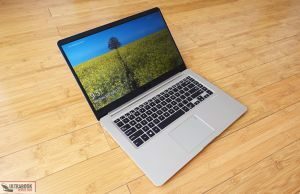 In other words, if you’re in the market for a thin-and-light 15-incher and don’t want to spend $1000 on it, this Vivobook S15 is your best available option. It’s a nice and practical laptop with a decent IPS screen, a good keyboard, proper IO and fast hardware. Of course, some corners were cut in order to meet the budget requirements, and the two most important ones are the averagely built plastic main-body and the small 43 Wh battery. 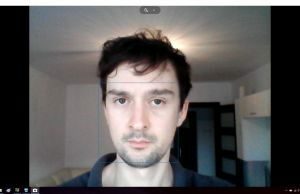 If nitpicking we could also add the mediocre webcam and the fact that the laptop gets warm and noisy under load, but that’s normal from a thin computer. 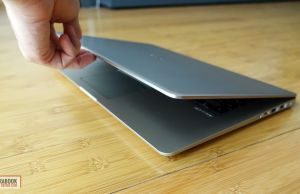 Bottom point, if you’re willing to compromise (not that much though) on build and battery life in order to save a few hundreds of dollars, the Vivobook S15 S510 is for you. On the other hand, if you don’t care about size and portability, you will find cheaper laptops with similar specs, and if you’re willing to spend much in order to address these issues, there are options for you out there as well. 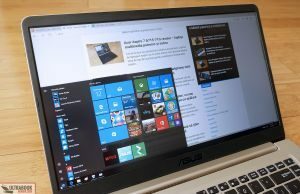 All in all though, I’m impressed with what Asus managed to do here and the Vivobook S15 gets our strong recommendation in its niche of budget thin-and-light full-size laptops. This pretty much raps up our review, but the comments section is open for questions, feedback or anything you might want to add, so get in touch. Thank you for this review. Do you have any idea about Asus VivoBook S15 S510UA (without Nvidia GTX 940MX)'s weight and battery life? 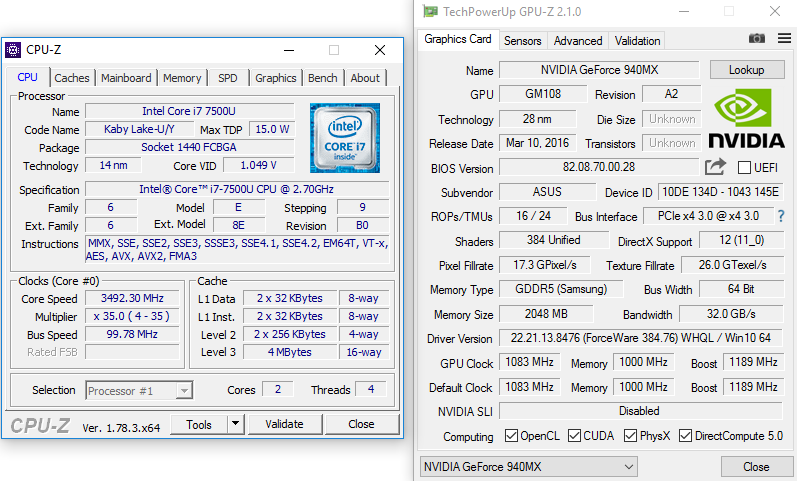 Without Nvidia GTX 940MX, S510UA might be lighter and/or have better battery runtime? 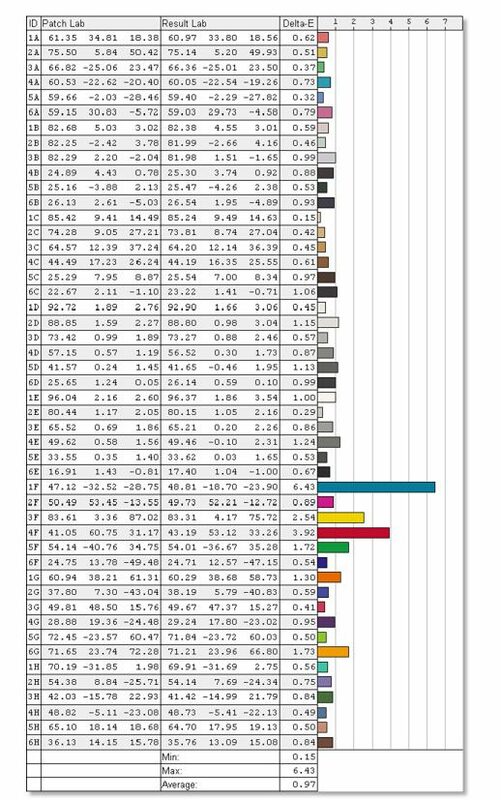 On some documents S510 is 1.5kg, some of them documented as 1.7kg. Is this about Nvidia GTX 940MX? Not really. The addition of the MX chip only ads a few grams to the total weight, the UQ and UAs are otherwise the same, around 1.6 kg according to my scales + the power brick. Also, with Optimus the Nvidia chip is only active when need on the UQ, which means that with movies and daily use you're still using the Integrated Intel HD 620 graphics that you'd also get on the S510UAs. That means battery life will only differ in games between the two. Between the Dell and the Asus, I think I'd go with the Asus for the much lighter body. Both are otherwise compact and have similar features and a 42 Wh battery. The Dell should be a little stronger in the main-chassis, but I havent' reviewed it myself so can't confirm. 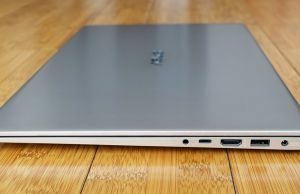 Nice review, which one do you prefer vivobook S15 510UQ or zenbook UX430UA? Which one do you think have a better value? Can't really compare them, they're not in the same price league. The UX430 is more portable, better built, gets a nicer screen, larger battery, but it's also more expensive. If you're not on a budget, it's the nicer pick and you can also consider the Zenbook UX530 when available if you want a larger screen. When UX530 will be available and what price range to be expected for similar configuration? It's already available in some regions and the i7 configuration with 8 GB RAM and 512 GB SSD sells for about 1300 EUR over here: pcgarage.ro/ultrabook/asus/156-zenbook-ux530uq-fhd-procesor-intel-core-i7-7500u-4m-cache-up-to-350-ghz-8gb-ddr4-512gb-ssd-geforce-940mx-2gb-win-10-pro-blue/ , which is about the same as the UX430. That should be about $1300 in the US, but I can't tell when it will be available over there, Asus have some odd availability procedures. I'm looking to spend around $1000 CAD(about $800 US). I'm really interested in this laptop but I'm wondering if I could find similar specs if I don't care about portability as much. As long as the laptop is less than 6.5 pounds I'd be happy. I do game on my laptop occasionally as well. If you have any suggestions I'd be very grateful. Thanks! Yes, you can find better specs in mid-range laptops like the Dell Inspiron 5000, Acer Aspire 5 and E15, Asus X556, Lenovo Ideapad 520, etc. 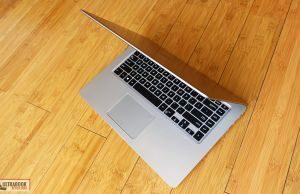 There's a list here: https://www.ultrabookreview.com/2404-14-15-inch-ultrabooks/#a1 . 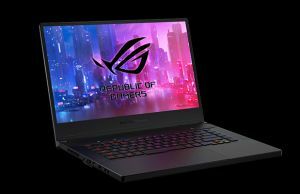 You can also aim for something like the Acer Aspire VX15 or Lenovo Legion Y520 with Nvidia 1050 graphics and quad-core processors for the faster hardware and much more capable graphics. Might no be available there yet, it's not available for retail in my region either. Could try to get in touch with Asus Japan on Twitter, Facebook or other social media that you guys use and ask about it. Would love to see a review of the new Vivobook Pro 15 N580. Strange how Asus announced the Pro and the S15 back in may, but they're still not available for retail in most areas. It will be up in about 2-3 weeks. 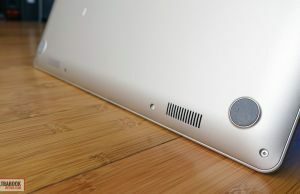 This and the Zenbook Pro UX550 are on the list. Do you know if this laptop can be charged via USB-C? Thanks for the review. I can't tell right now. 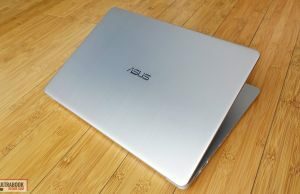 I did review the UX430 (https://www.ultrabookreview.com/14425-asus-zenbook-ux430-review/) which is very similar, just a little smaller. 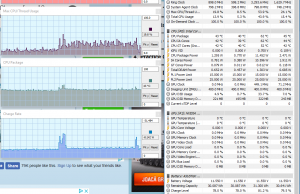 it was pretty noisy with daily use, the fan is active all the time on most Asus laptops, but there's a way around it. As far as temperatures did, the chassis gets to mid 40s Celsius in games, but that's normal for a thin-and-light.
" 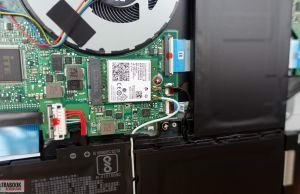 the fan is active all the time on most Asus laptops, but there's a way around it." There's a custom piece of software called NoteBookFanControl that allows you to keep the fan from spinning until the CPU reaches a certain temperature. 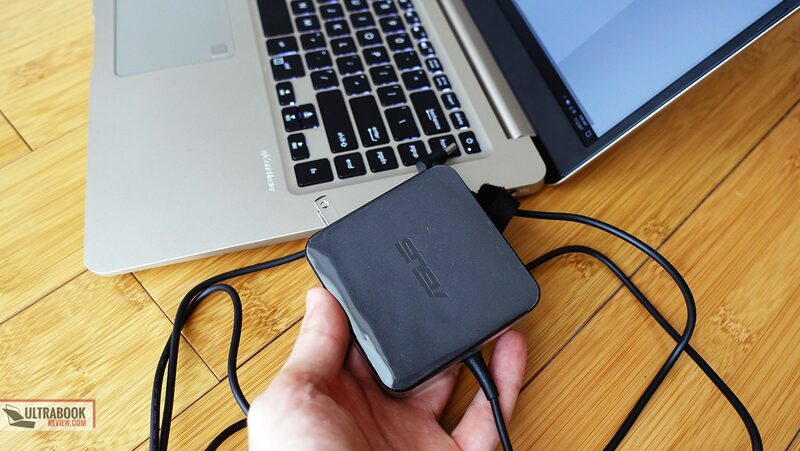 It's not official from Asus, but it works with most laptops. You'd have to use it on your own risk, though. Google it for more details. Will this laptop be useful for programming and coding? ?i mean for a developer as well as programmers. Would you personally get the Acer aspire 5 A515 with the mx150, i5-7200u and 4gb ram or the vivobook s15 with similar specs but with the gt940mx? IF you care about gaming, then the Aspire 5 is the better pick. It's also well priced. The Vivobook S15 is however a nicer looking laptop, more compact and lighter. Depends. Cheaper models usually have more quality control issues, but that's not a common rule. I'm also not an adept of shopping based on brand, pretty much every laptop has its flaws and every OEM has series with more or fewer issues. My advice is to read the forums and users reviews on the big online shops, that's going to give you a measure of the potential problems. You could also get extended warranty. Unfortunately you'll not get that kind of battery life with most laptops, especially in your budget. You'd need something with a very big battery and thus won't be lightweight. You didn't mention a screen size, do you want a small laptop or a 15-inch full-size one? 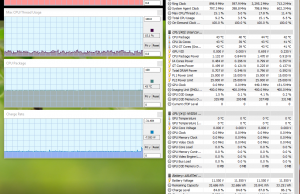 The asus vivobook s15 has quite noisy fans even on normal usage. Why do u think so it is so? 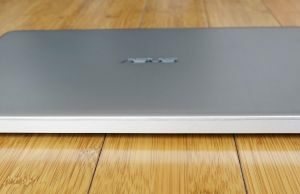 I have looked for several possible laptop model and happen to find Acer Swift 3 ( from several reviews they mention the battery life is around 7-8 hours on moderate usage for browsing multitab and some typing) but from my previous experience the awesomeness of Acer didnt last long till I got some issues. I prefer a 11-14'' screen size coz I'll be using it everyday and bring it here and there. Typing, Battery Life, and Weight are major critical feature I'm looking to be comfortable with. It'll be very helpful if you can recommend some type, thanks! 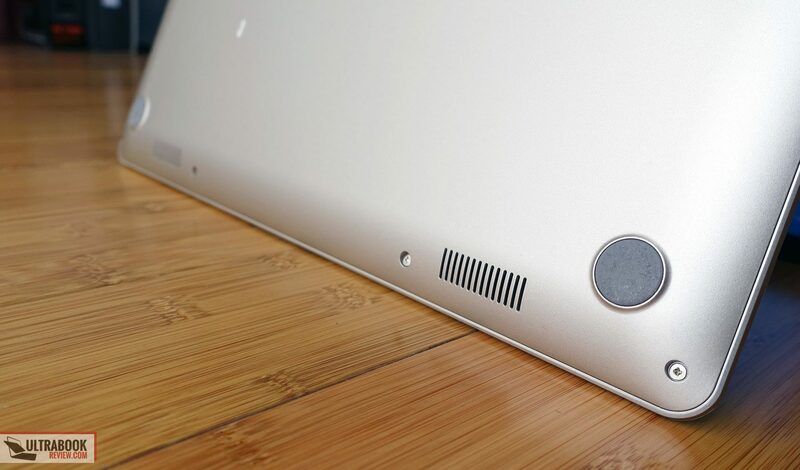 The Swift is a pretty good laptop in its budget. As far as reliability goes, most brands have quality control issues and Acer are no stranger from them. However, I don't think you should skip this brand for this reason, whether you'll end up with problems is mostly based on luck these days. When I'm in the position to buy something I usually get extended warranty and try to find out which brand has better support/service in my country, so in the eventuality something will go wrong it would be easy to repair. Very appreciate for your review. Which laptop do u recommend Asus Vivobook s15 and Acer E15 E5-573G? 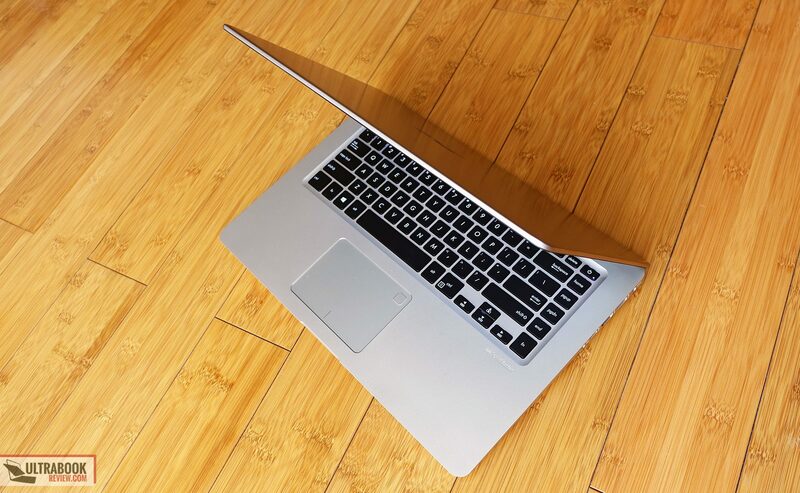 The S15 is nicer laptops, newer and smaller, but I'd reckon the E15 sells for much less. You'd have to give me more details if you want an opinion, like specs and price for each one. Both of them are within my budget for an intel i5 processor laptop,so the price is not a concern for me. I want a laptop for multitasking,heavy browsing and light entertainment such as watching youtube.Battery life is quite important for me too. U could recommend me better laptop other than those two for similar price range.Thank you for your opinion. I've recently bought this model and the backlit keyboards are not working. I've tried pressing the function key with F3 and F4 but it doesn't light up as well. DO you have the keyboard pictograms on the F3/F4 keys? If yes, try to install the ATK software package from Asus's drivers webpage. If that doesn't fix it, you could also google for "asus keyboard light driver", this is not an uncommon issue and there seems to be fixes. Can't tell which one would work in your case though. If after installing, ATK still dont light up, RUN this "C:Program Files (x86)\ASUS\ATK Package\ATK Hotkey\HControl.exe", it worked for my version of ATK update. 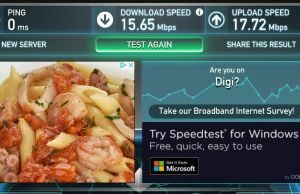 Sharing in case this is still an issue for you or maybe other ASUS customers. I wonder if this device or the S14 variant has a PCIe slot? Nice review. Which laptop will you recommended Asus vivobook s15 or Asus zenbook ux410? Same specs? It's a hard decision, as one one hand I like the lager screen and still loe weight of the S15, but on the other hand a 42 Wh battery is rather small. Ya. Which of it the battery life will be more longer? Hey, I was thinking of buying one for my undergrad level engineering courses including courses of solidworks and autocad. Should I go for i5 or i7? And how much battery backup can I expect ? Probably i7 and I'd also put 16 GB of RAM on it. MY main nit with them is the small batteries. Not sure what's on the 510s that you're interested in, but if it's the 30 Wh option then I wouldn't get it. This is an excellent review and I also appreciate that you take the time to answer all the comments. 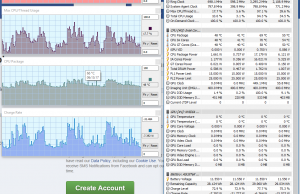 Currently, I have a ASUS F555L with 12 GB RAm and a replaced 256 SSD. 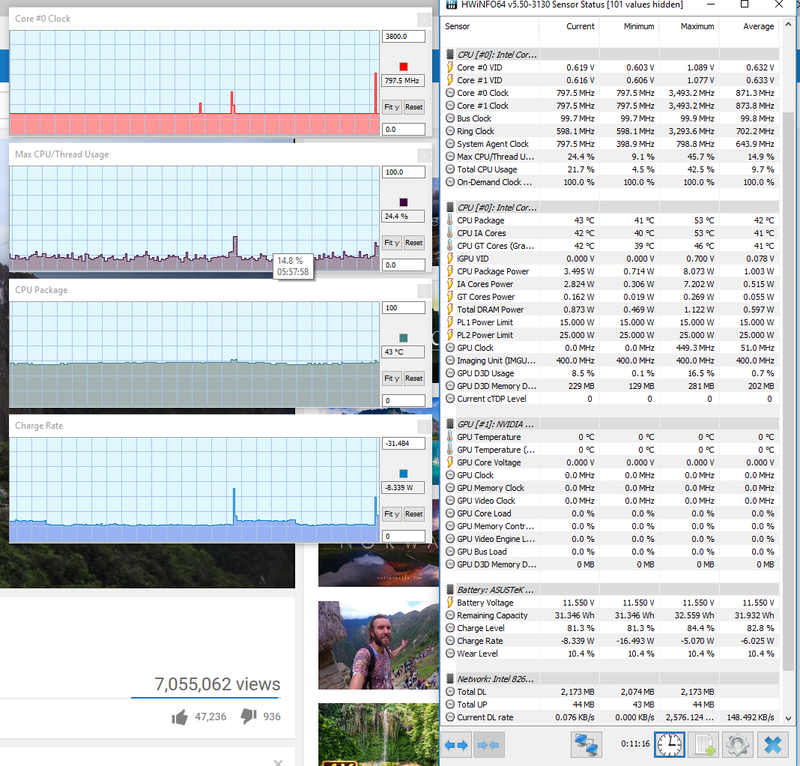 It runs surprisingly fine, but I find that when rendering videos for YouTube, it can be pushed to the limit. I use Movie Studio Platinum V.13 for my videos. I am thinking of buying the Asus Vivobook Slim K510UQ [K510UQ-BQ336R] Intel i7-7500U/16GB/512GB SSD/15.6inchFHD/GF940MX-2GB/WIN 10Pro configuration. The question I have is, will I likely experience a significance gain in rendering performance and processing power or would I not any real difference? If you have any thoughts, I would really appreciate them. 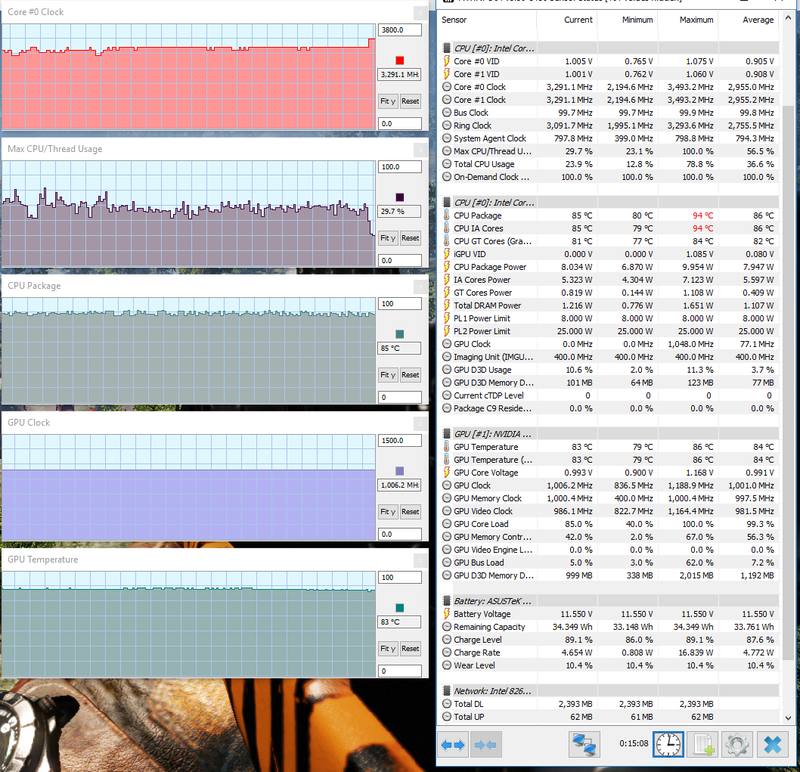 I'd probably get a Core HQ laptop for rendering. 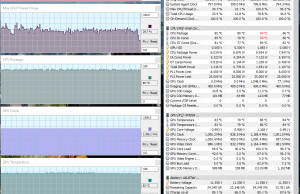 I'm not familiar with that software you're using, but with Premiere the Core Us struggle. Thank you for that advice. I checked into it and ended up getting a ASUS ZenBook Pro UX501VW-XH71T with the 7th Generation Intel Core i7-6700HQ instead. Nice review Andrei. 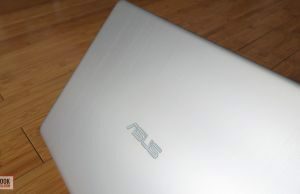 I am planning to buy ASUS VivoBook S15 S510UN (Core i5 8250U, MX150). Will be able to handle high-end games at low settings? Also wanted to know which one will be a better choice? 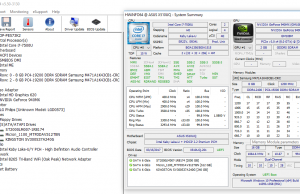 Core i5 8250U + Nvidia MX150 or Core i5 7300HQ + Nvidia MX150 in terms of overall performance. 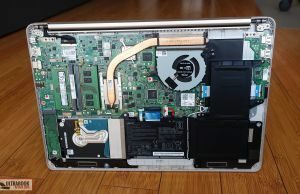 Does the S510UA without dedicated GPU also has aggressive fan action? I haven't tried it. 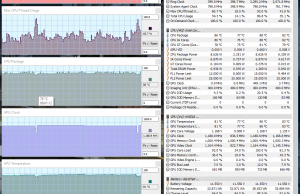 Normally it should run quieter though, as there's no GPU to cool of. 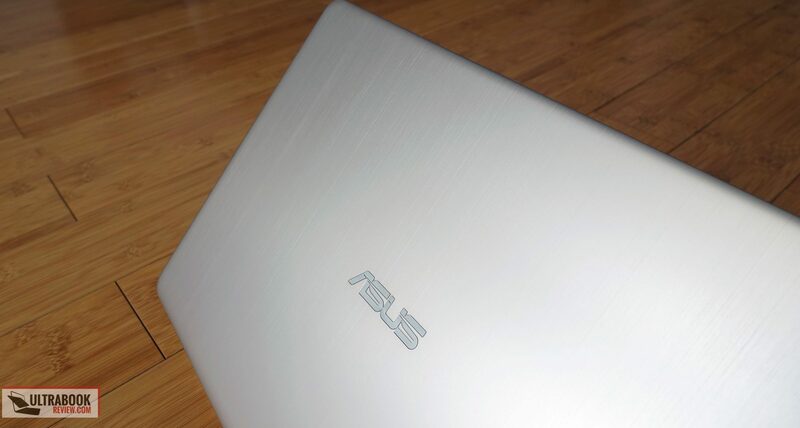 I am torn about two models (as another reviewer): The ASUS Zenbook UX430UA and ASUS VivoBook S510UQ. If the models do not have HDD (just 256 SSD), how will this affect the battery and the noise?. 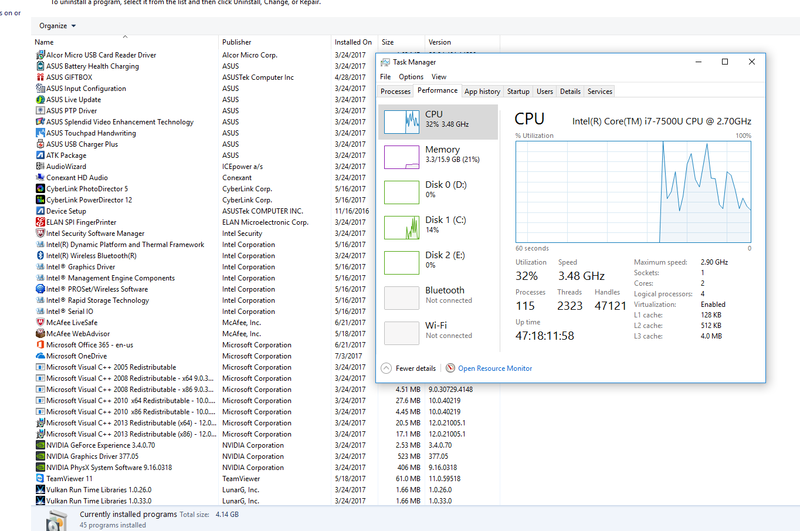 Also, considering that I do not play games but I have around 7 different programs open at the same time (several from MS office plus those linked to them, heavy programming environments, and around 20 browser tabs open), would I be better off with the i7-7700 that has 4 cores (in the Vivobook model) or the i7-7500 (in the Zenbook) that has 2? Do you know how does battery life, noise and performance of these models compare with and ASUS Zenbook UX303UA (i7-6500, dual core)? Thanks a lot! I would much appreciate a quick reply -I need very urgently a new laptop :) . 1. The fact that there's just a SSD should have an impact on battery life, but I'd say it's going to be minor. 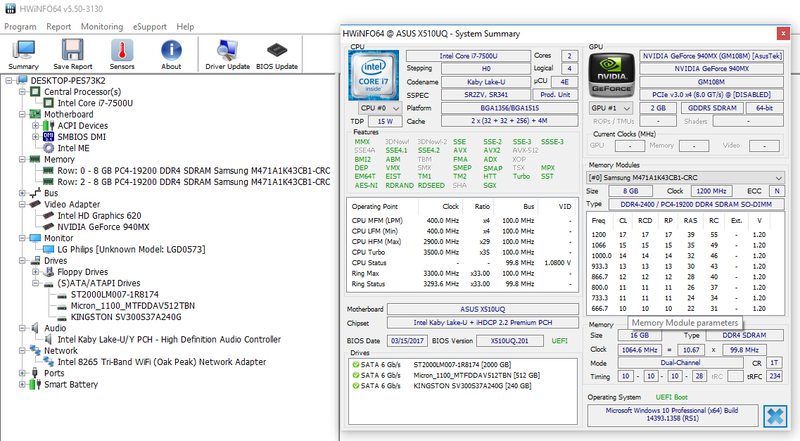 2. the i7-7700HQ is the better choice, but the 7500U is more efficient. Up to you if you're willing o sacrifice performance (to some extent) for battery life. 3. that UX303UA should be very close to the UX430UA. The i7-7500U is a minor ugprade and it has a 50 WH battery, so close the 52 Wh battery on the 430.
after reading some of the site's reviews (thanks! 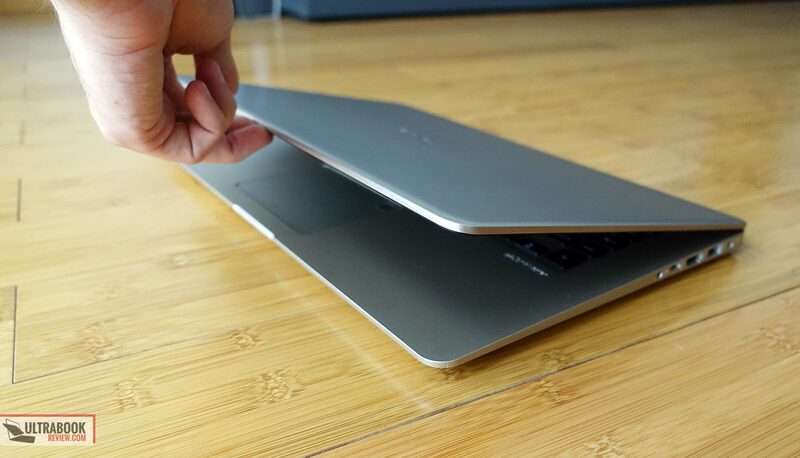 ), I can't still decide between the VivoBook S15 and the ZenBooks UX430/UX410. I appreciate the bigger 15" screen of the Vivo and 4h battery life doesn't sound that bad (though definitely worse than ZBs), but I have the feeling the building quality is definitely better in the Zenbooks. In fact, my perfect Notebook would be the 15" screen Zenbook (or a Dell XPS 15"), but it's too expensive (I don't want to spend more than $1000). Can you give me a final advice? (even if it was a completely different model, the fan thing sounds concerning even with the app). Thank you!!! Is the UX530 available in your country? Shouldn't be much more expensive than the UX430. My first time on this site. Learning a lot. 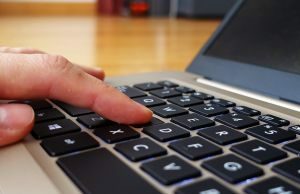 Can you recommend a medium-priced($400-$800) laptop for a writer whose main needs are researching on the Internet and wordprocessing, and email. Need a comfortable keyboard. Not interested in gaming, don't need touch screen. Screen should be 15" or better. Thanks. Hi, as someone who types for a living, I'd say it's best to give keyboards a try in person if possible. Imo the Lenovo ThinkPads get some of the most comfortable keyboards and laptops like the ThinkPad E570 or the IdeaPad 520 should fit within your budget. 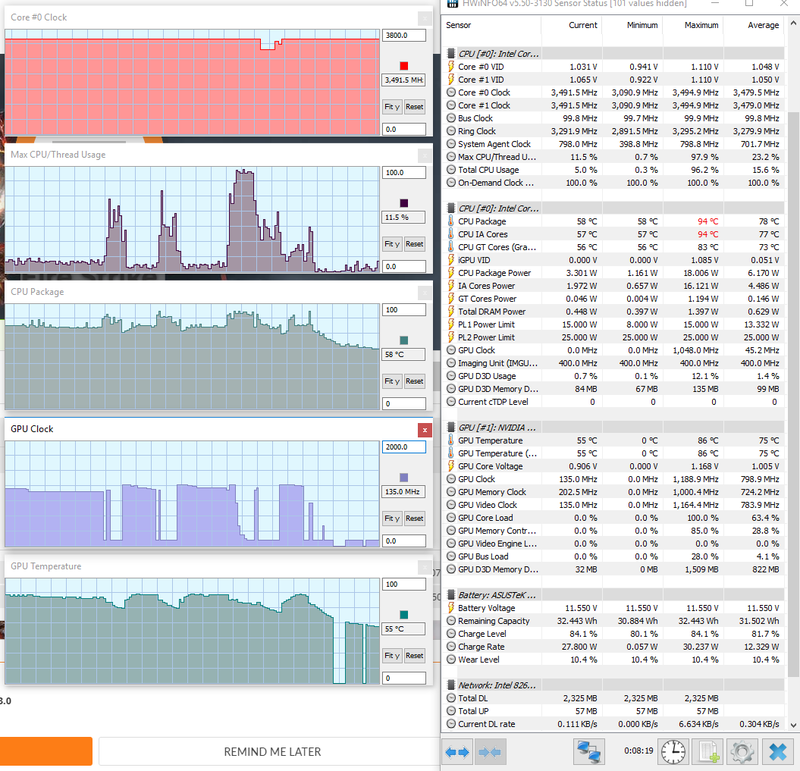 Aim for a configuration with a Core i5 processor, 8 GB of RAM, an IPS screen and preferably SSD storage. There are other laptops from Asus, Acer, Lenovo, Dell that also fit your requirements, but like I said, it's best to go to a shop and give various keyboards a try. I could then help out if you narrow down your options to a few options that you liked and get back with a reply. Hi, can I ask if ASUS S510UQ BQ165T is compatible with heavy rendering/modeling/animating, like so architectural works? Thanks for the great review though! 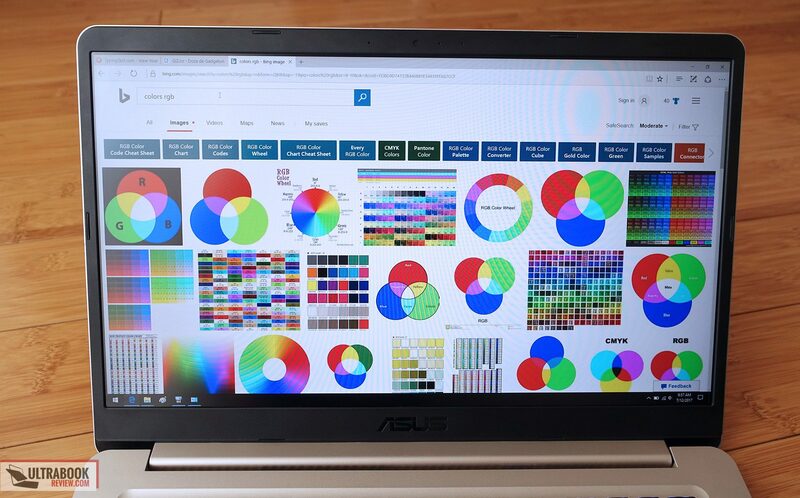 Hi, can I ask if do you recommanded ASUS Notebook S510UQ Monitor 15.6" HD Intel Core i5-7200U Ram 4GB Hard Disk 1TB Nvidia GeForce 940MX 2GB 1xUSB 3.1 1xUSB 3.0 Windows 10 Home, to use autoCAD for univesity (predominantly autocad 2d) ? I have the possibility to increase RAM up to 16GB and this way I should be able to work well on this pc. Thank you very much for your very useful review . I want to get an advice on buying a laptop: I work with laptop for 7 to 8 hours a day (programming, browsing , etc.). The firmness and weight of the laptop is also important to me for transportation. I don't play game a lot. 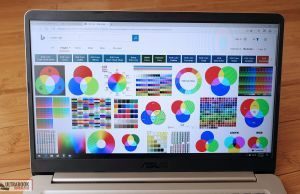 Because of working with Photoshop software and editing videos and …, it's also important for my laptop graphics and hardware. With a budget of up to $ 1,300, what's your ideal suggestion between ASUS laptops ? I'd get something with a Core HQ processor, SSD storage and 16 GB of RAM. There are multiple option out there, the articles here on the site will help you narrow down the options. Thanks alot. But laptops with HQ processors have a high weight. I want a laptop with a weight of up to 1.8kg. I rarely do graphic work, as well as editing photos and videos (the primary use of Photoshop and Premiere software). 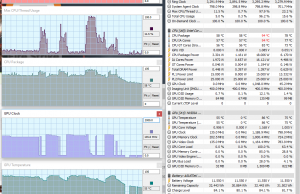 The most important point is that the laptop not to run hot in Prolonged use. Thanks you very much for your input! I measured about 45 dB in demanding loads at head level on my unit, which is about average for thin and lights these days. Did you notice any grain on the display? 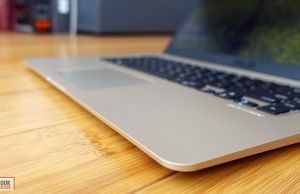 On certain plain backgrounds, such as white or grey, there's a noticeable grain to my device, especially if I do not look straight on at the laptop. Not sure whether it's just the way the screen is, or whether there's a fault with my screen. It's not a massive problem, but it is something I occasionally notice. I haven't seen any other reports of this. The chassis also arrived ever so slightly bent, and there is massive flex, but that's to be expected given this and other reviews I have read. Yes, that's standard with matte screens. I'd reckon you've used a glossy screen before? Probably. 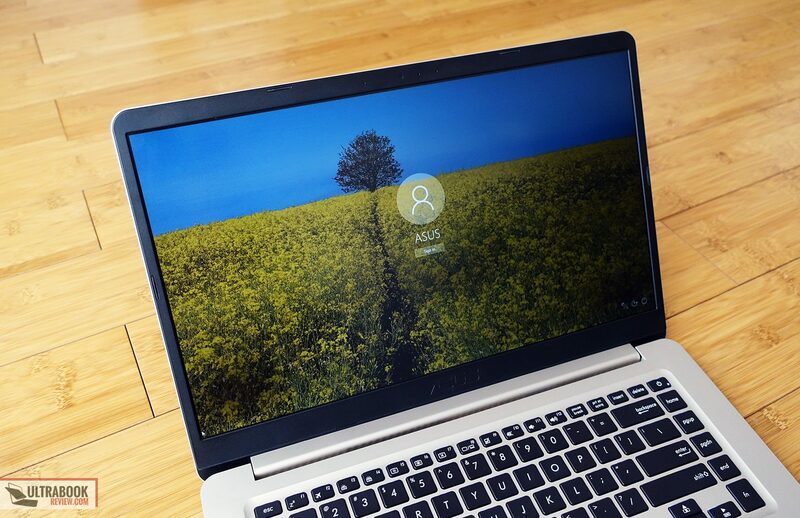 Recently went though a HP Spectre 15.6 x360 (2017) and Dell XPS 9560, which had very different screens – to be expected, given the former was touch. I suspect both are glossy? However, endless problems with both of these devices resulted in me returning them, and instead going for the 'budget' Asus, which will keep me going for a year or two when hopefully HP and/or Dell will improve the quality of their premium line. If not, the new Surface 15" laptop looks like a fantastic piece of kit, even if the value for money is not as good. The Spectre had massive screen wobble/shaking from the slightest of movements (even when typing), an unconformable sharp edge that digged in when typing, audio problems (hissing and popping or staying silent for a couple of seconds upon playing audio through headphones), screen display intermittently breaking up, coil whine, buzzing when using touchscreen, the 'down' button being stiff. A real productivity killer, the biggest productivity killer being the shaky screen which I found extremely distracting and annoying. I had went through two of these after replacing the original device after the left speaker broke. The replacement device had all the same problems as the first. 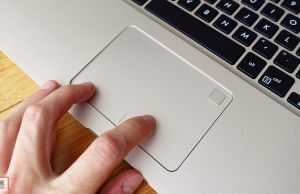 The XPS was better, but I didn't much like the typing experience – the keys felt nice, but the keyboard felt like it was not wide enough so I often made typing errors. The enter key was too small as well. There were also problems with coil whine, the loud fan constantly being on, and the WiFi connection regularly being lost – a problem with the 'Killer' WiFi card they used apparently. 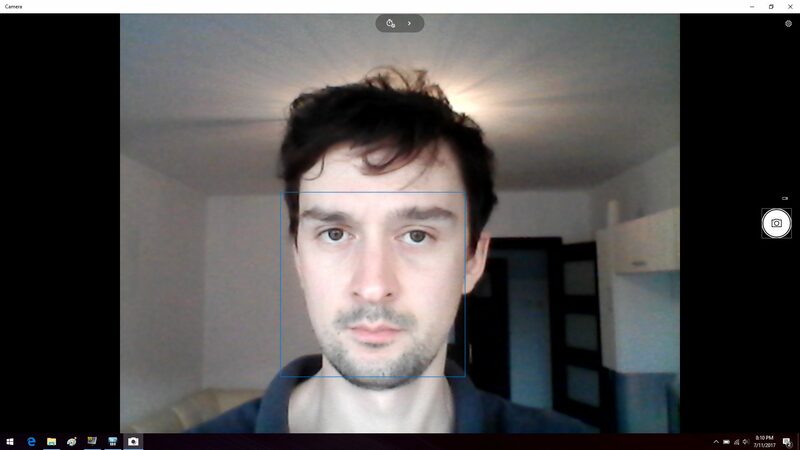 The placement of the webcam is also ridiculous. Further, there were problems specific to my device – a dead pixel and the charging box decide to emit a high-pitched noise and sparked when I plugged it in! 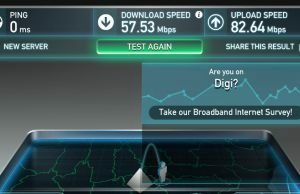 So far, my experience with the Asus has been far better. I will need to upgrade in a year or two due to the work I'll be doing, but for now it does the job, and does not affect my productivity. The typing experience and key travel is nice, when the fan comes on it is quiet, there's no coil whine or high pitched noises. The only real problems are with the screen quality not being that great and the poor quality chassis – but neither affect my productivity. 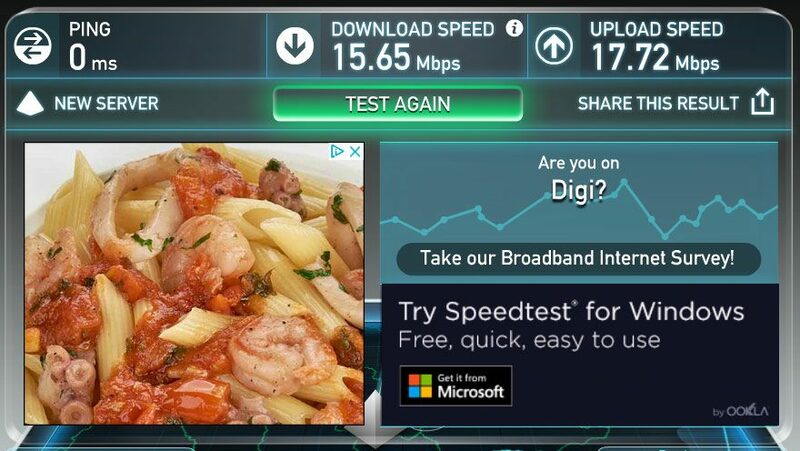 I am very happy with this device. Obviously, given the lower price paid, expectations are also lower. 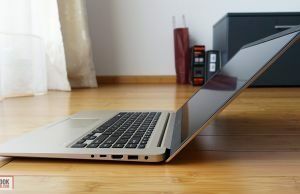 When you pay as much as the Spectre or XPS cost, you expect perfection, but my experiences of those devices fell well short of that (my biggest priority when purchasing a device is productivity – the Spectre in particular was very disappointing in that regard as I have alluded to). Nice thank you, it's a while i've been looking for a thorough review like this on this pc. I'm about to buy an s510un model with only one 1TB HDD and was thinking about adding myself a M.2 SSD. What i find hard to find is the compatibility. 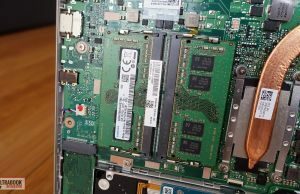 Wich m2 ssd would be suitable for this laptop? Would something fast like an Adata ASX7000NP work? Or do i have to stick with normal SSD? 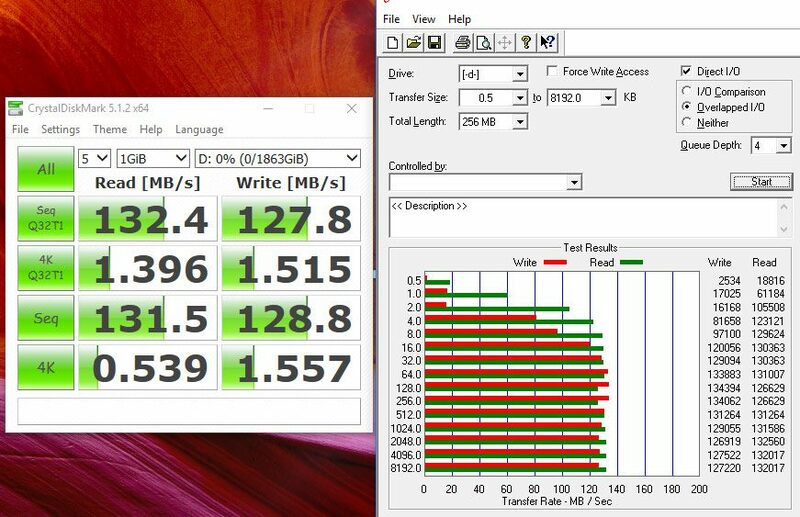 You can use an M.2 80 mm SSD, like that Adata, although compatibility is impossible to determine for sure without actually trying the drive on your unit. Perhaps you can buy from a place that allows returns in case it doesn't work. Or you can replace the existing HDD with a 2.5" 7 mm SSD. First of all, I would like to appreciate the effort/ time spent by you in replying to each comment individually. 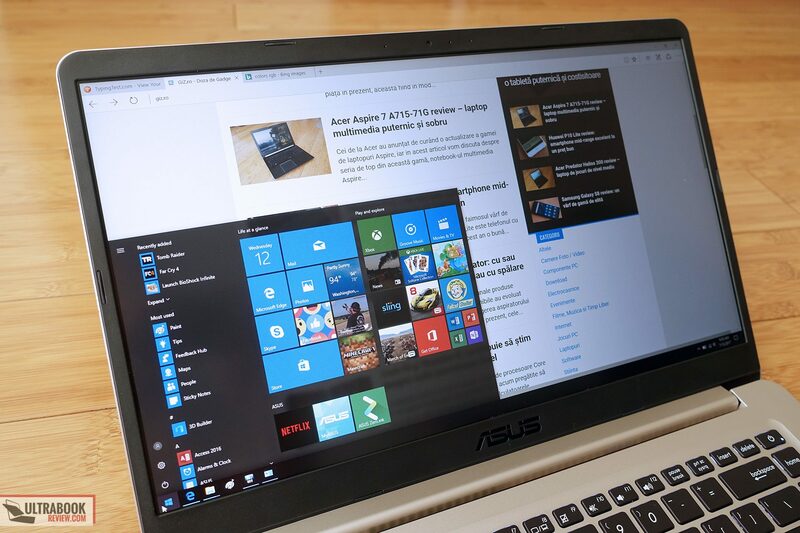 I am also planning to buy a new laptop and inclined towards Asus Vivobook S15 as I find it impressive with thin bezels and 8th generation processors but I have also read (you have also mentioned) that this laptop heat up after continuous usage and its battery life is not much. 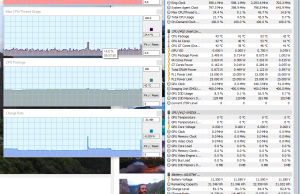 I am a hard-core programmer who needs to work for at least 10 hours daily, therefore, I am expecting my laptop not to be noisy and it should not generate heat. Battery backup can be taken care of as most of the times, I am sitting near my desk. Can you suggest me a laptop with good configuration/ reviews ? My budget is approx. 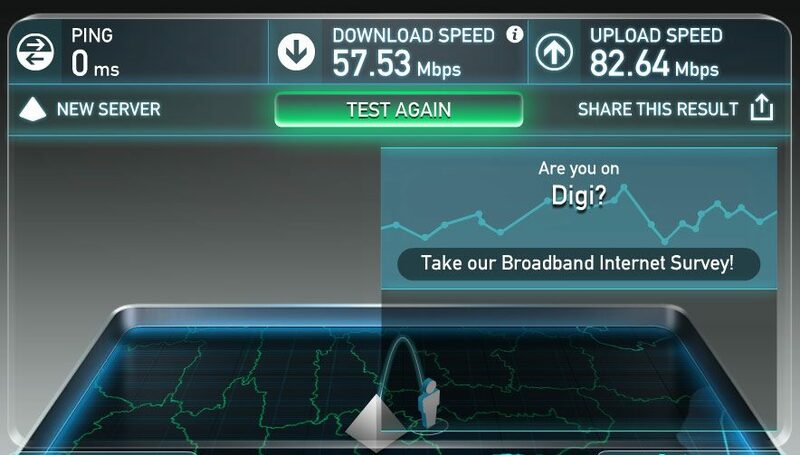 $1500 (I am from India). Though I am inclined towards 8th generations processor, still I am confused while making selection between 8th generation processors and i7-7th generation HQ processors. You should probably go with one of the full-size laptops and if battery life is not a concern, rather opt for one of the 45W 7th gen quad core configurations. There's a list of 8th gen laptops here: https://www.ultrabookreview.com/17655-kabylake-r-laptops/ , as for 7th gen 45W options, you should try to narrow down the options based on your requirements and I can then help choose between a few final models. 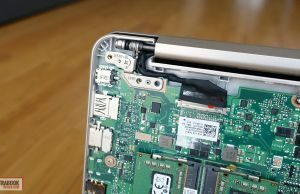 Asus Vivobook S15 vs HP PAVILLION 15-CB052TX. Which one you suggest ? Can't comment on the HP, haven't touched it. Asus Vivobook S15 vs Dell Inspiron 15 7570. Which one is winner ? Thank you for the review, which one do you prefer vivobook S15 510UQ or x556uq? Which one do you recomend? 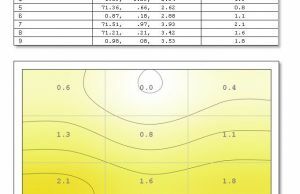 For analyze and big data. I prefer the S510 for its lightweight and compact build, but the smaller battery might be a deal breaker. 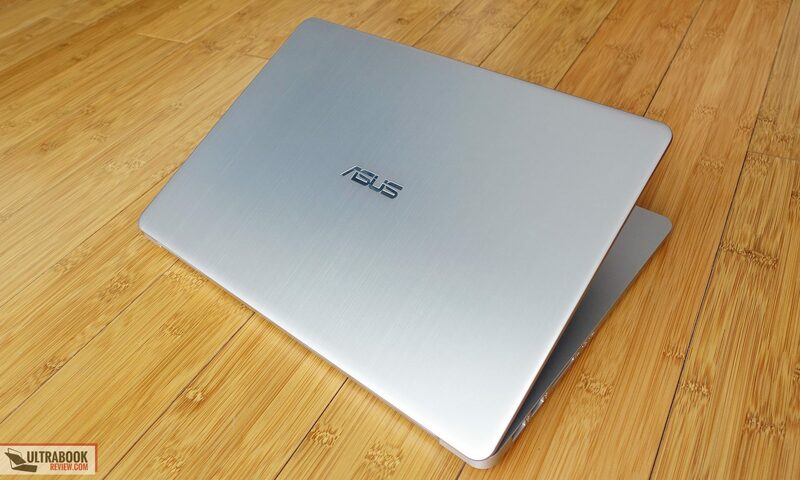 dude, what do you think about asus vivobook a405u? I can't find much about it, if it's the x405u sold with a different name in your area, then it's an entry level laptop with decent hardware. It's made out of plastic and has a pretty small battery and non-backlit keyboard. Depending on the configuration it might get a HD TN screen as well. Not sure how much it costs, but it should be very affordable. Hi,thanks for your great reviews. 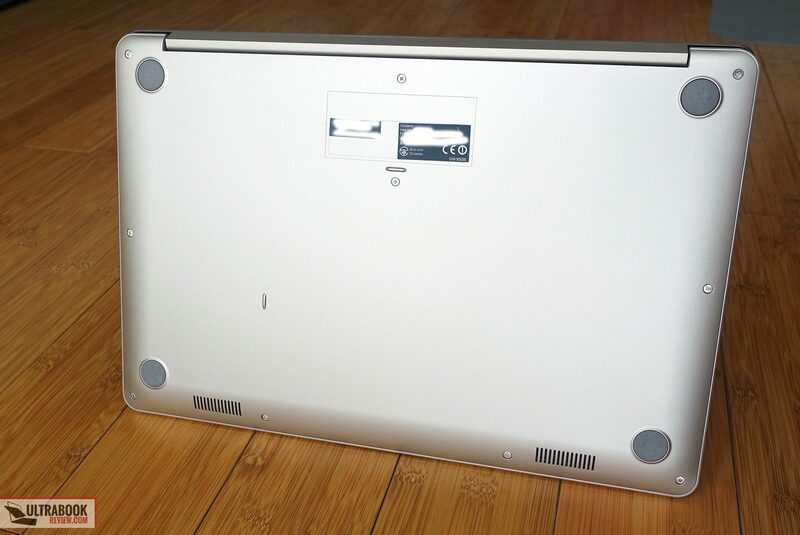 Actually I’m trying to find a lightweight or at least not heavy laptop mainly for watching movies, so do you think that the S510 screen is good enough for watching movies? And as I’m gonna buy it for the next 4 years do you think it worth buying an Asus ux 430ua or any laptop at that category?! Can you tell me which laptop’s the best for me in market if i wanna pay 1000 $ atop?! You mention that the notebook can have a max of 32GB RAM. Asus' website says the max is 16GB, and in the model reviewed both slots are filled. I know sometimes the manufacturer published max RAM numbers are incorrect (I have an older Asus that says it maxes out at 8GB and it's running 16GB fine); my question is: is there any testing so far where we can show for sure that it takes 32GB? I haven't actually tested it, no, but since there are two memory DIMMS inside, I assume each can get a 16 GB memory stick, unless Asus somehow limited that in BIOS. Is it not compatible with a .M2 NVMe PCIe SSD? Are you sure? Hi, thanks for your good review. I want to ask you something that will clarify my thoughts. I will use some basic programs for my work and also office programs. I am thinking to buy "Asus S510uq" with i5 7.th gen, because it is very portable and looking good beside it looks has good performance. I also wonder how much fps approximately I will get in the medium settings with: fifa 18, assassin's creed black flag and origins, cs go and far cry primal, are they playable with this laptop. I am looking forward to hear you! Thanks. hey thanks for your great reviews! I want to run cad software like catia or solidworks and i'm willing to play games sometime. i can't decide between this one (with 8gb ram and 940mx) and the acer swift 3 with i7 8550 and mx150 graphics which unfortunately has a dim display. so you think i should go for the acer for better performance and compactness yet the display or go for the asus? I got the UN version of this – S510UN BQ218T. 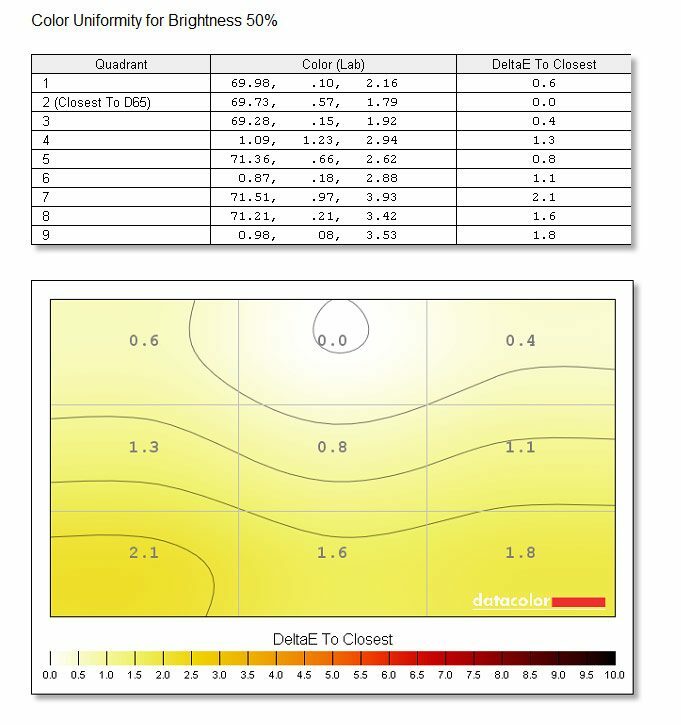 Do you have the calibrated color profile for that screen? Might have the same panel. Try the profile available here and see if it's any good. Thank you Andrei. I doubt if is the same panel because mine is a 72% NTSC Panel. Will try that profile anyway. Is the 510un with 8th gen i7 processor better then lenovo ideapad 520s with the 8th gen i7 & pcie ssd? Looking for a laptop for college as well as some light to moderate gaming if possible. Nice review, which is better among this and hp envy 13 2017…will hp envy give better battery life ? Andrei, I am looking to get a new laptop. 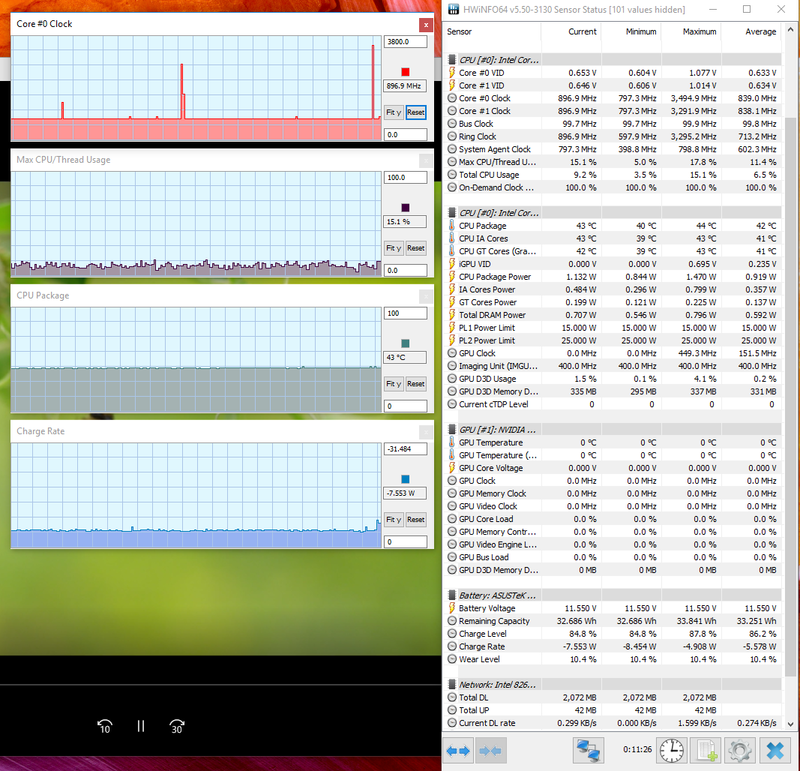 I like Asus 15.6". I do emails, utube, iTunes, play solitaire, search the web, use excel and word almost daily. Which laptop would you recommend for me? 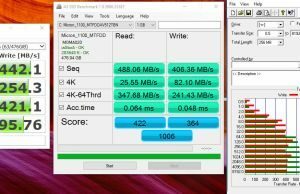 I have an Asus X750LA which has been very good, but it is too slow for me. I would appreciate an answer from you very much. I trust your judgement. Is there any support for multiple monitors? I would like to use at home with 3 external monitors for typical office applications. Any 8th generation cpu news for these? I am a Computer science student. And Confused between Asus vivobook s15 s510un(i5 8th gen) and Acer aspire 5 A515 51G(i5 8th gen). I liked the asus vivobook more but worried about the battery performance and heat management. Does it have really poor battery life? My wife and i both use S510UQ with 8th gen i5 8250U 1.6-1.8 processor, 940MX GPU (7.89 GB RAM), with 120GB SSB (wife upgraded to 250GB) & 1 TB HDD, 8GB RAM (wide upgraded to 12 GB). Wife paid USD800 total including upgrades). What do you need this for？Running OS and app from SDD, there is no additional noises and no excess heat as well as good processing speeds (Win 10, MS Office, Photoshop, Video, Internet, Music? TBH we never needed to run notebook on battery much so battery life is non-issue. Slim form factor and low weight welcome bonus for portability as long as electric outlet available. I needed one for Programming and media consumption. I am a computer science student and wanted to handle all my programming related stuffs with ease by my laptop. 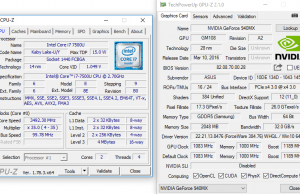 Sir can you please tell me which processor is better in performance i5 8th gen 8250U(Asus vivobook s15 s510UN) or i5 7th gen 7300HQ(HP pavilion power 15 cb 518tx)? Hi, your test is complete and accurate. 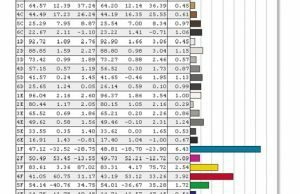 really useful in my research to compare computers, I now only look at your site. Your article is of very high quality. Thank you. 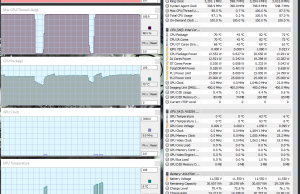 Does anyone know if the 8th gen i7 model runs quieter for day to day use or is there still a heating issue/noisy fan? 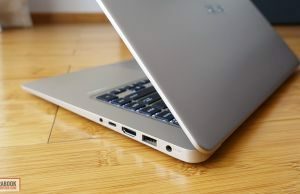 Hi, I am pondering between the Vivobook S15 S510 (i5-8250U, MX150, 16GB RAM) and the HP Pavilion 15-cs0033TX (i5-8250U, MX150, 16GB RAM), do you know how they fair with each other? My major purpose is (1080p) video editing and rendering on the go, so the thin and light form factor with the IPS screen is crucial. Battery life I would say about 4 – 5 hours is sufficient, if more would be good. I have very limited experience with HPs in recent years, they're hard to come by over here. I also couldn't find a proper review online. If you're interested in video editing, you should try to find more about the screen and how it performs with heavier loads, and then compare to the VivoBook and see which one gets on top. 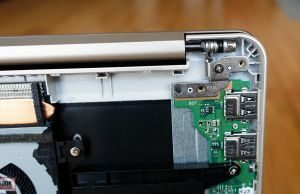 As for battery life, you'll realistically get around 4h of everyday work from the 42 Wh battery inside this laptop, and the same from the 41 Wh battery inside the HP. Hello Andrei, I was thinking of going for a510u instead of s510u due to battery longevity. What do you think (as these are the only two available where I am)? I'm going for portability, good use for common user and probably some engineering stuffs later so I'm thinking i5-7 or i5-8, and SSD and 8GB ram. But despite having all of the same specs, I see different prices for both. I want a laptop with a 15.6" screen, but as compact as a 14" laptop, because I have limited desk space. Would this laptop meet this need or should I consider getting a different laptop like the 14" Vivobook? 3. The sleep/timeout functionality is absolutely horrible. There's noway to tell if the screen is off or if the laptop is in sleep mode. Combine that with the delay in wake up time and it's a nightmare of on/off loops. I know it seems like a lot, but this list is much better than other laptops I own. Definitely recommend this.